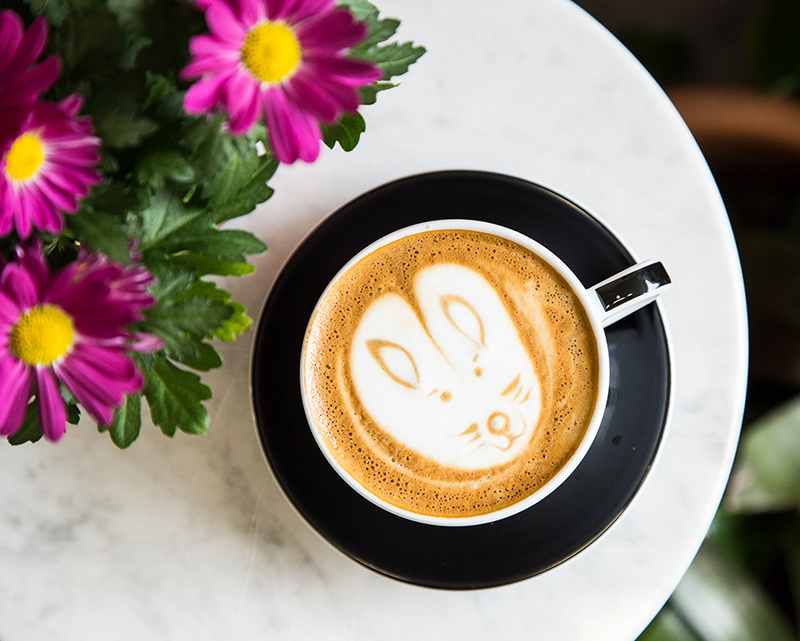 This May at 24 Ninth Ave. in NYC , we'll be celebrating Mother's Day with Tiger Stripe Reserve Espresso Honey-Lavender Lattes and Affogatos. With free shipping online, you can raise a Morning "with her" Mug , to toast Mom with just roasted coffee direct from the roasting plant. Another great Mother's Day treat is the new Rose City Genmaicha from Smith Teamaker. This delicious, delicate green tea offers flavors of toasted rice, roses and sweet honey in the cup. 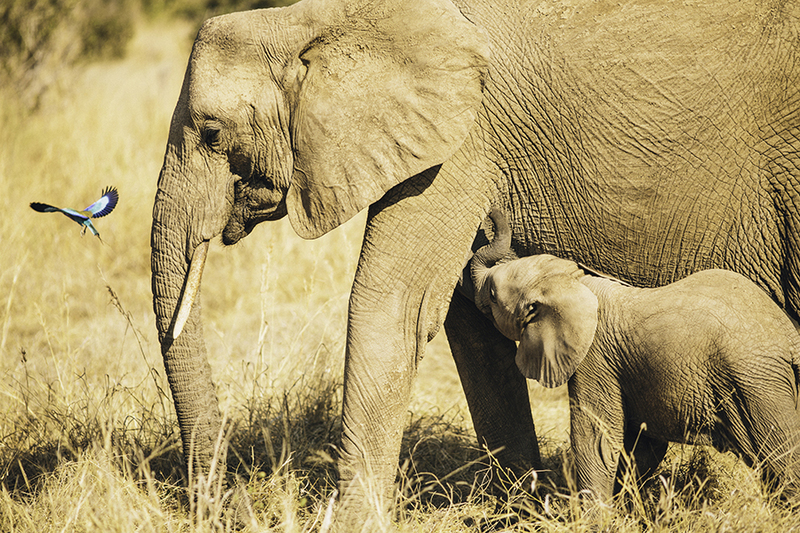 We hope you have a wonderful Mother's Day, filled with joy and love! April is one of our favorite months of the year with the spectacular show of trees and flowers budding and their beautiful blooms! The global celebration of Earth Day takes place on April 22nd, and as part of the culinary world we strive to do what we can to build a future where agriculture will thrive harmoniously with nature. This is the goal of our Canopy Tree Project , which a portion of our profits go towards all year long. P.S. - If you plant trees in honor of Earth Day, coffee grinds make a great fertilizer or compost addition! 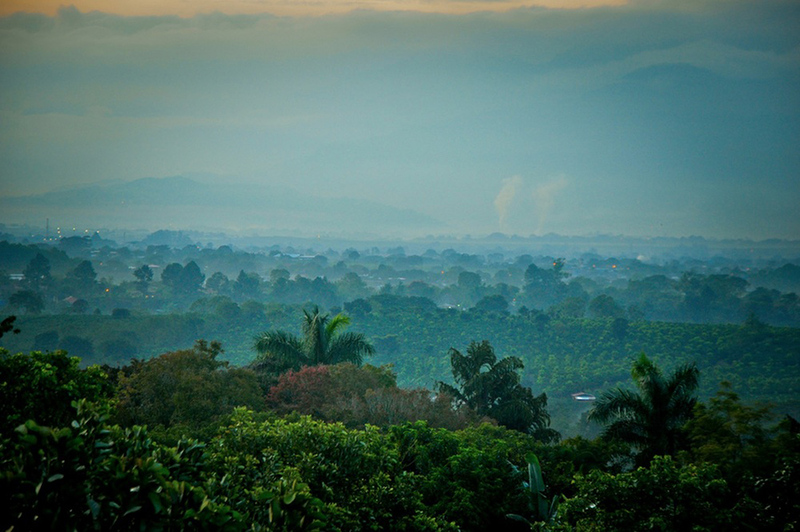 Pictured right - citrus fruit trees, just before planting, on Coffee Farms in Costa Rica for our Canopy Tree Project. At 24 Ninth Ave. in NYC we're getting ready for spring. Soon our patio will be filled with warm sunshine and cold drinks. 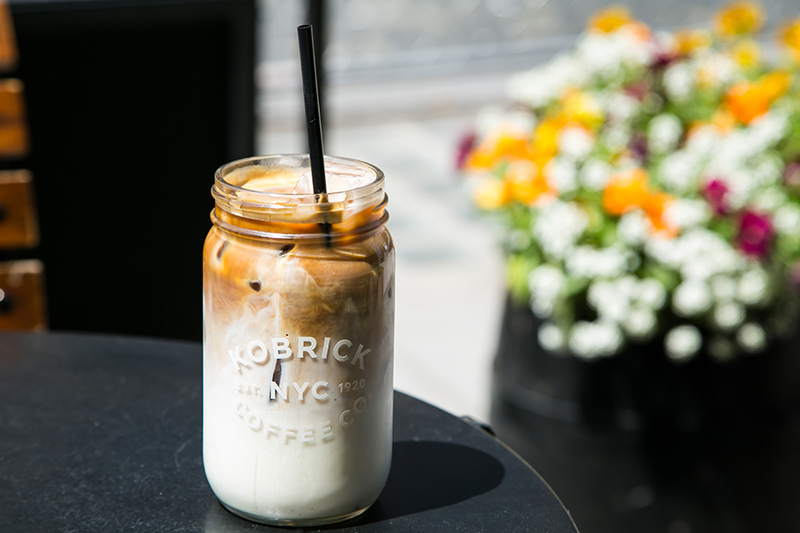 Refreshing cold coffees, like our Iced Lattes (photo right) will officially be in season! To celebrate, we are offering Free Shipping on $50 or more through the end of March with coupon code SPRING19. May Spring 2019 blossom with many happy and delicious moments to celebrate! Each day closer to March, spring weather starts to make way into NYC. We have a few great pre-spring just roasted coffees, ready to "bloom". Sumatra Gayo Orangutan - Just north of the equator in the Gayo Highlands, small scale coffee farmers grow this sustainable coffee in the special climate of tropical rainforests. The unique flavors include notes of roasted nuts, semi-sweet chocolate and delicate spice, with an exotic finish cultivated from the surrounding ecosystem. These farmers play an important role to help save the critically endangered Orangutans. Colombian Narino Honey - Direct from the Martinez family farm in Narino, Colombia. Rich flavor with notes of blackberry and delicate pear. Bright yet smooth to the finish. Ethiopian Yirgacheffe Natural - Delicate acidity with elegant hints of spice, cinnamon, sweet cocoa, and a pronounced peachy-apricot finish. 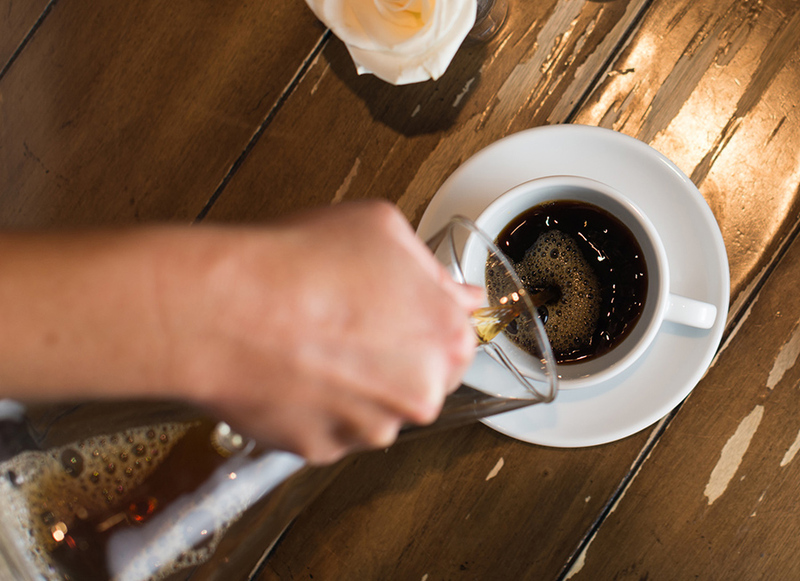 Experience the "coffee bloom" with pourover or french press brewing. Fresh roasted coffee begins to release gasses as the hot water hits the grinds, which creates a rising effect called the bloom. The fresher the coffee, the bigger the bloom. Sipping coffee, while relaxing at home with the ones you love, makes any day sweeter. Cozy up with your family, best friends or anyone you love, and enjoy a rich cup of coffee with your favorite Valentine's Day treats. 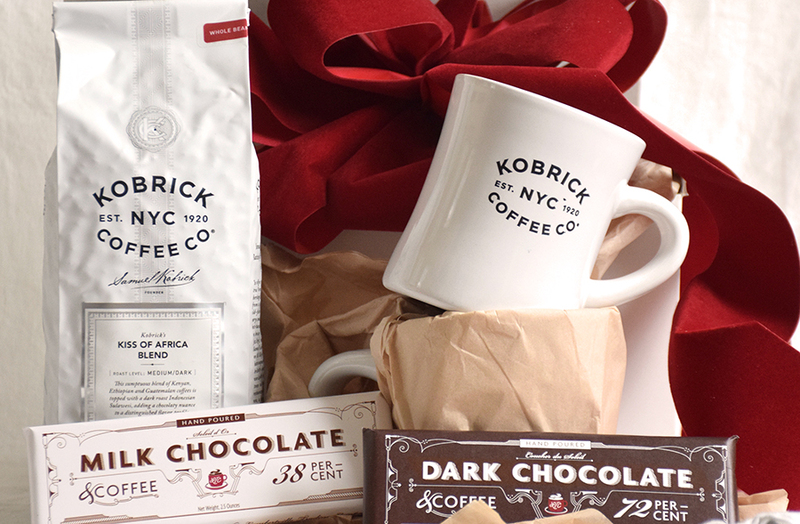 Check out our Accessories Page for great gift items such as mugs or Kobrick Coffee Chocolate Bars, to pair with coffee by the pound. We even have a new Small Dog Sweatshirt to share your love with the little pups in your life. 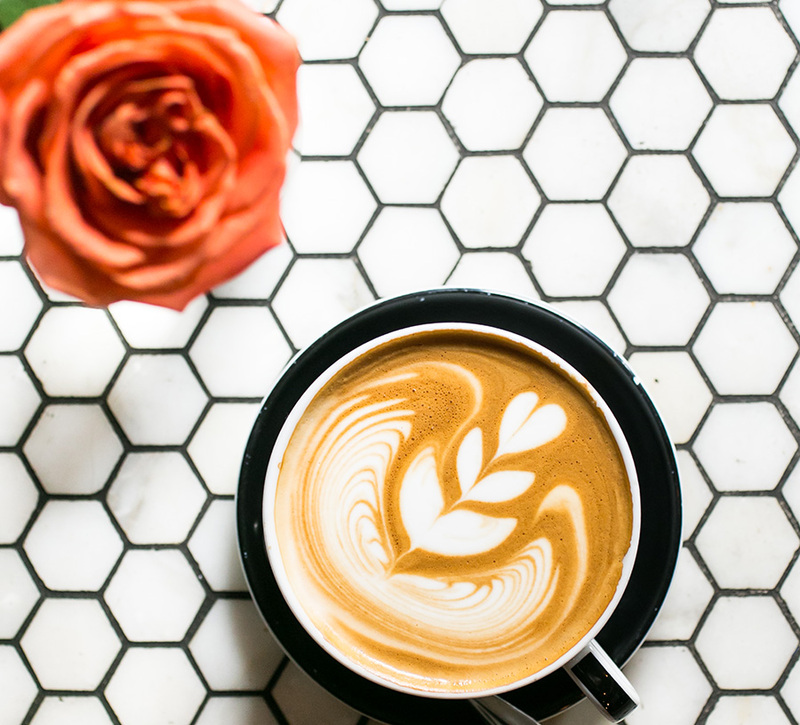 For Valentine's Day, we're wishing you a latte love with the ones you love! What's Brewing for 2019 | Happy New Year! 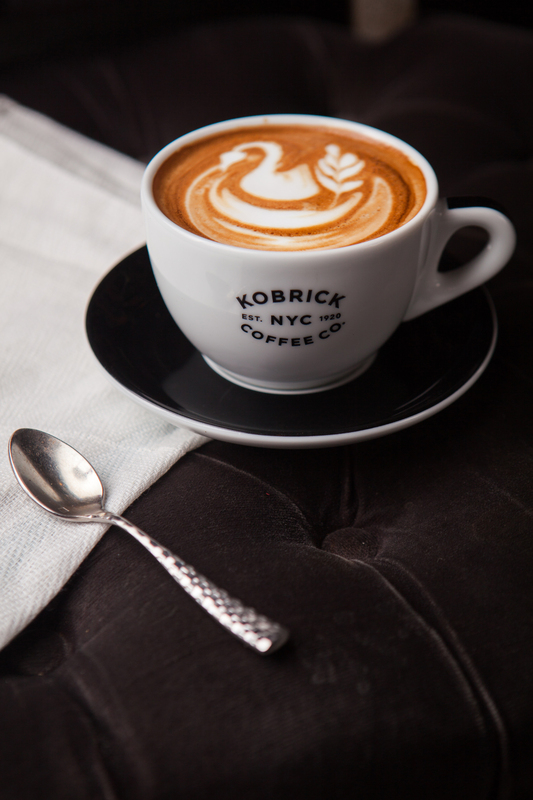 We at Kobrick Coffee Co. are proud to have been roasting and serving delicious coffees for 99 years! We are looking forward to wonderful moments filled with great new coffees, coffee libations, and coffee cocktails. Just in and delicious: Ethiopian Yirgacheffe Natural Process; delicate acidity with elegant flavors of spice, sweet cocoa and a pronounced lemony citrus note. 15% off online this week (no coupon code needed). At the cafe you can try our coffee libations, which are similar to a mocktail; a hot or cold beverage such as our Cafe Roxy; double espresso, cream, panela, cinnamon, and fresh orange zest oil. 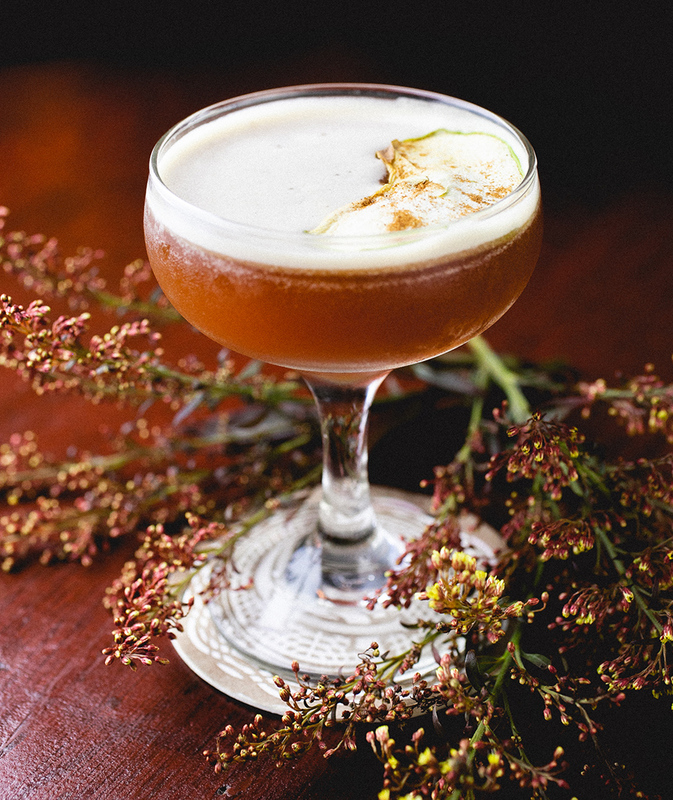 Also, at 24 Ninth Ave. NYC you can sip a craft coffee cocktail such as the Misty Flip (photo right); four roses bourbon, half and half, egg, tiger stripe espresso sugar, grated nutmeg. 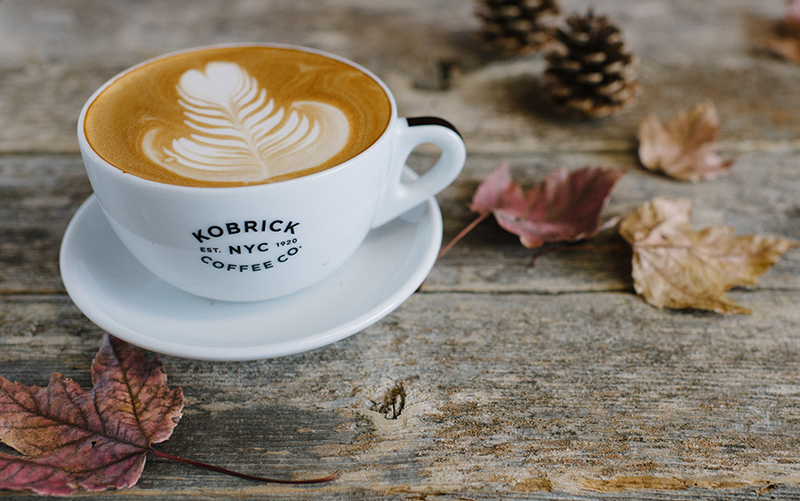 From our family and the team at Kobrick Coffee Co., we wish you happiness, health, good times and great sips. Happy 2019! Joy-Filled Holidays and Happy New Year! Going on 99 years, through 4 generations of our family, we've been roasting our coffee to order so it's as fresh as possible when it's brewed. With sincere thanks to you, our customers, we would like to extend our gratitude and warmest wishes during this holiday season. We hope that you've been enjoying our services, in the cafe and through our online store. 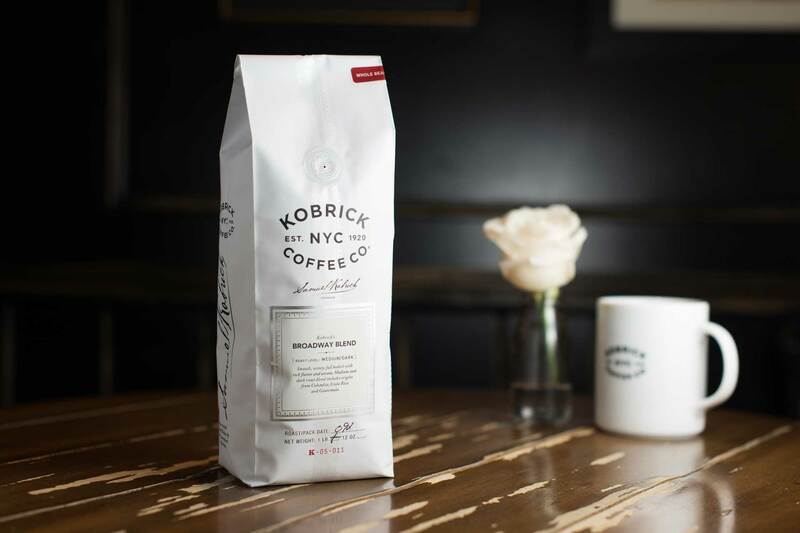 We would love to hear from you and about your shopping experiences with Kobrick Coffee Co. 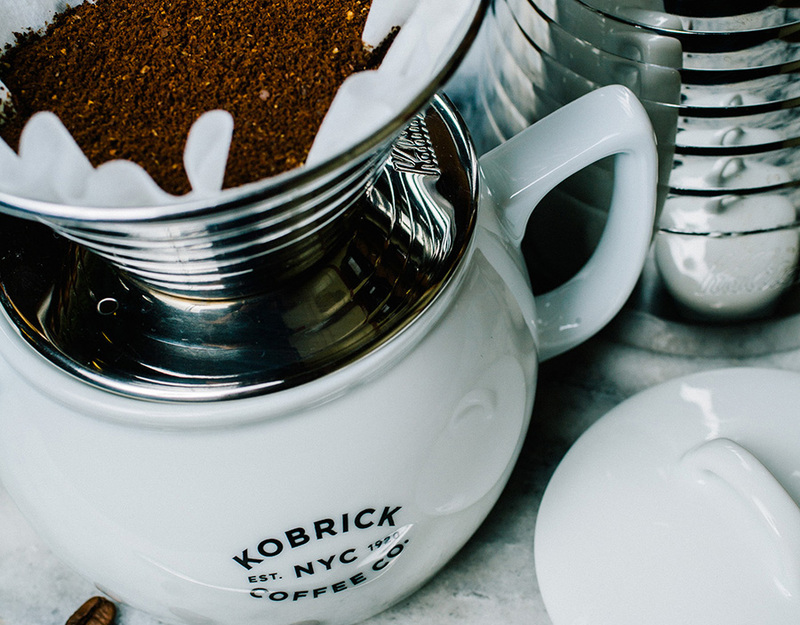 Please email us your thoughts to info@kobrickcoffee.com. We hope you are having a wonderful and joyful holiday season and we wish you a happy and healthy New Year! 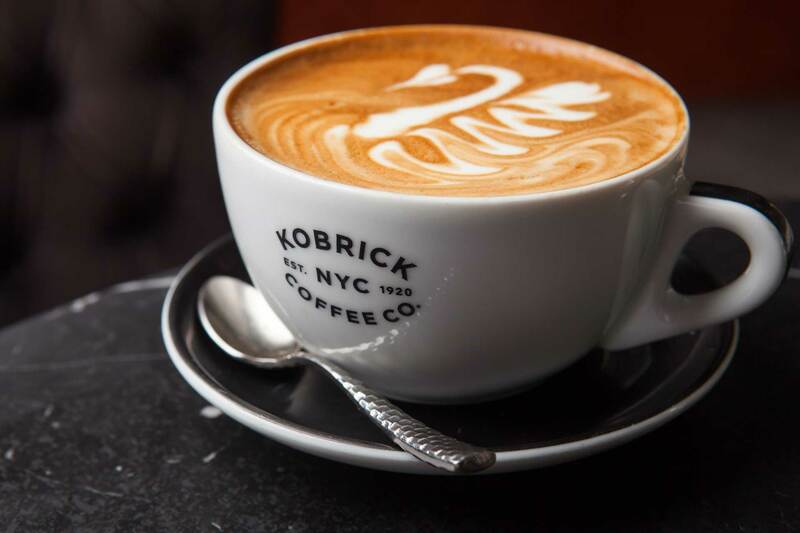 At Kobrick Coffee in NYC we have delicious warm mochas perfect for winter, or great seasonal cocktails like the "Merry Paloma" (pictured right). If you are in NYC we invite you to cozy up at the cafe this holiday season. No matter where you are sipping on your warm cup of coffee, we extend much gratitude and thanks! We wish you a wonderful holiday season and a Happy and Healthy New Year! Rich flavors of roasted nuts and chocolate develop in the cup, as a delicate fruity undertone highlights this well balanced Fair Trade Organic Blend. 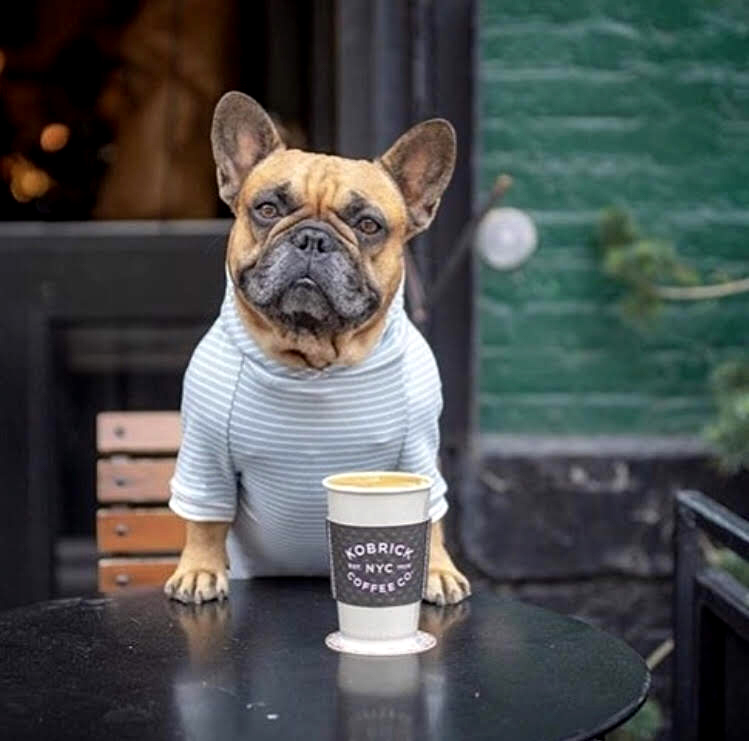 A portion of the proceeds from the sale of this year's Home for the Holiday Blend will be donated to an amazing organization, New York Bully Crew . This nonprofit organization saves dogs who would otherwise be living in harm’s way. Volunteers take care of them with love, and find them wonderful forever homes. Follow them on Instagram and witness stories of compassion, hope and love all year long. In the spirit of the holidays we look forward to giving back to this wonderful organization. As Thanksgiving approaches, holiday soundtracks begin playing and early holiday gift giving is on our minds. There's a lot to love about this season, and within the excitement of it, we launch the celebration with a Black Friday, Small Business Saturday, and Cyber Monday Special. In addition to our favorite fall coffees on sale, we are offering free shipping as well! We wish you a Happy Thanksgiving filled with warmth and deliciousness from the kitchen and to spending a sweet and treasured time with family and friends. With "thanks" to our customers, we look forward to this Holiday Season with you! Brewing great coffee at home fills the house with its rich, cozy aroma and warms the soul with each delicious sip. If you're visiting family or friends on Thanksgiving, coffee by the pound makes a great gift to send or bring along. 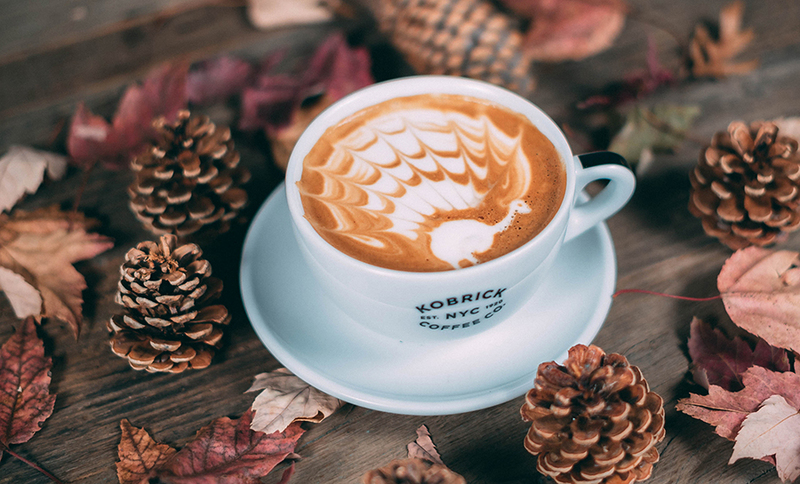 As we begin planning our Thanksgiving menus, we consider coffees that pair well with traditional menu flavors like Maple, Pecan and Pumpkin. Here are a few favorite Fall Favorites at 10% off through Thanksgiving. No coupon code needed. Cape Horn Blend - Highly aromatic and complex; the unique flavor profile of this blend is truly exceptional. Dark Velvet Blend - Full bodied with a sumptuous, smooth flavor and medium-low acidity. Bold yet nuanced. Also available in decaffeinated. Papua New Guinea - A superb coffee with a pleasant nutty tinge. Colombian Anei - Fair Trade Certified Organic. Nice body and crisp with notes of fruit, hazelnut and cacao. We hope you have a colorful November leading up to a wonderful Thanksgiving. With thanks, we toast... Cheers! 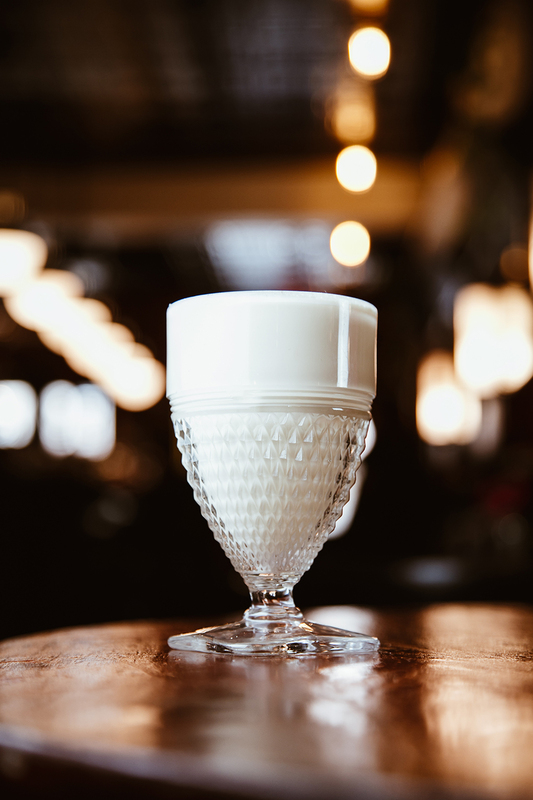 As pop-up costume stores dot the New York City streets, and pumpkins and spooky decorations dress the brownstones and local shops, we are getting ready to pour spooky looking lattes. 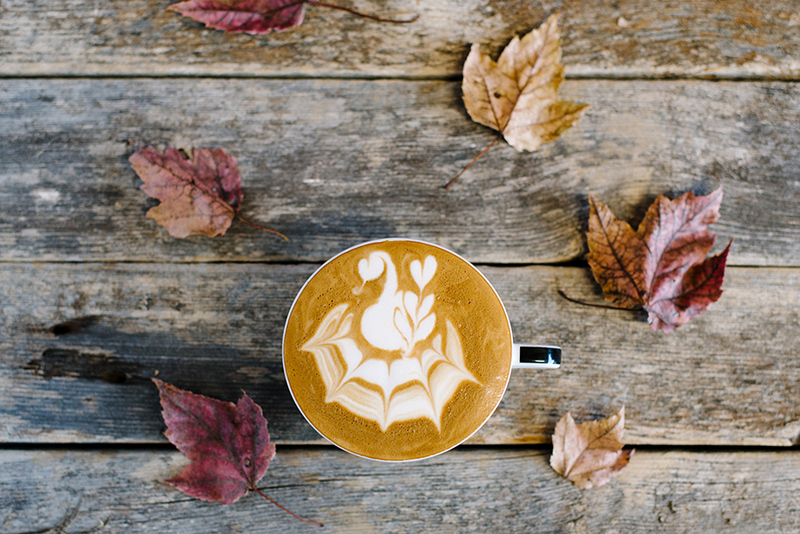 The jack-o-lantern latte pictured here, was poured and then hand-drawn by our guest barista Remy Molina. He was visiting NYC from Costa Rica for the New York Coffee Festival where he won the Coffee Masters Title in a heated throw-down last Sunday. Congratulations to Remy! We hope you all have a Happy Halloween! Tiger Stripe Reserve Espresso ; Deep and complex flavors with hints of dried fruit and chocolate. Smooth, wonderfully aromatic, full bodied richness. We donate a portion of the proceeds from the sale of our Tiger Stripe Espresso to the International Fund for Animal Welfare toward the conservation of the endangered tiger population. Tiger striping is the leading visual indicator of a good espresso extraction. 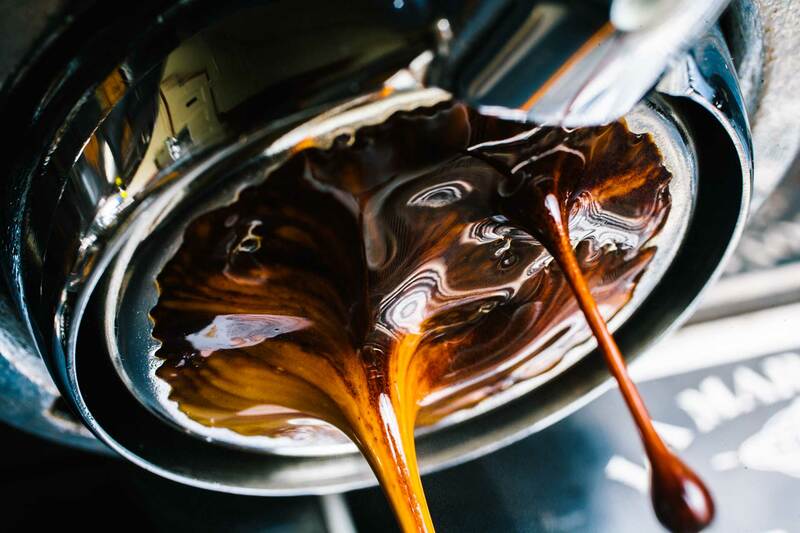 Tiger striping is formed by the contrast of darker and lighter crema in the espresso stream; ideally it begins early in the pour and is sustained through the end. Coffee Day is September 29th! In the Cup: The honey & natural process delivers floral sweet, winey notes with a honeydew-chocolatey roundness. Hacienda Sonora is located in the Central Valley of Costa Rica, at the foot of the world renowned, Poas Volcano. The average altitude is 1,200 m (or 3,900 ft) above sea level. The coffee grows in an environment surrounded by exotic trees and other vegetation, providing a great condition for quality, as well as improving the chemistry of the already naturally rich volcanic soil. The farm’s area is composed of shaded coffee, wild forest reserve, and sugar cane. Thanks to the farm’s diverse ecosystem, many different species of birds and animals seek refuge on the land. 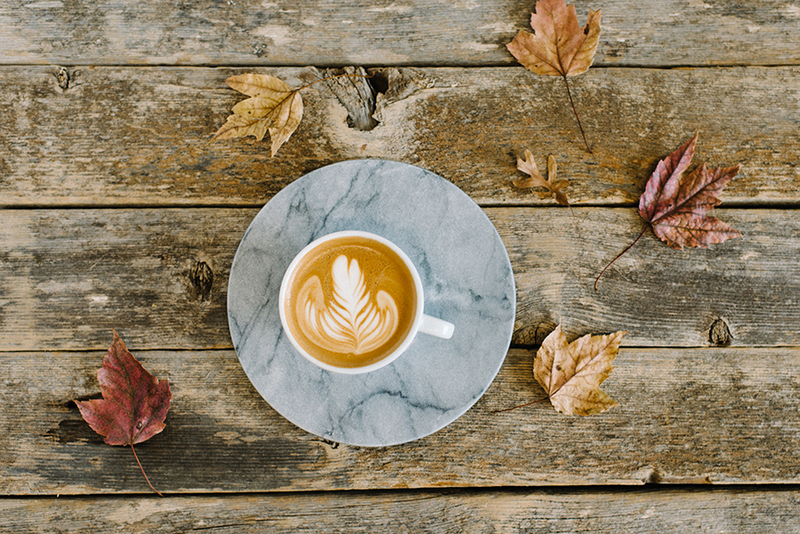 As fall approaches this September, we get ready for a little chill in the air with warm coffee in our cups. • Kiss of Africa, with its chocolaty nuance. • Kenya AA, with a winey hearty snap. • Papua New Guinea, sweet with a nutty tinge. • Tanzanian Peaberry, aromatic, winey, snappy and vibrant. Cheers to a wonderful fall season! Getting back to the "daily grind" is more exciting with coffee. At 24 Ninth Ave. we offer up our creativity with espresso, cold brew, coffee, coffee cocktails, and a variety of non alcoholic libations. 1. Make your Cold Brew using a French Press with cold filtered water (instead of hot) and let it steep overnight. Click here for French Press Cold Brew Instructions. 2. To make the Koco Freddo; use a cocktail shaker with 3.5 oz. of cold brew, .75 oz. of maple syrup, 1 egg white and 1 teaspoon of coconut oil. 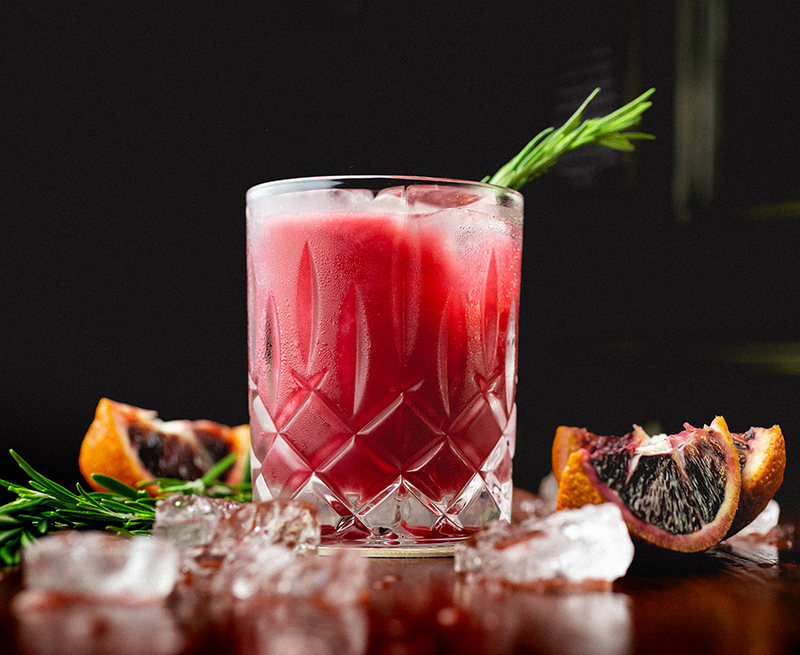 Shake rapidly, pour into glass, (option to pour over ice) and enjoy. Cheers! Wishing you a Beautiful Labor Day Weekend! 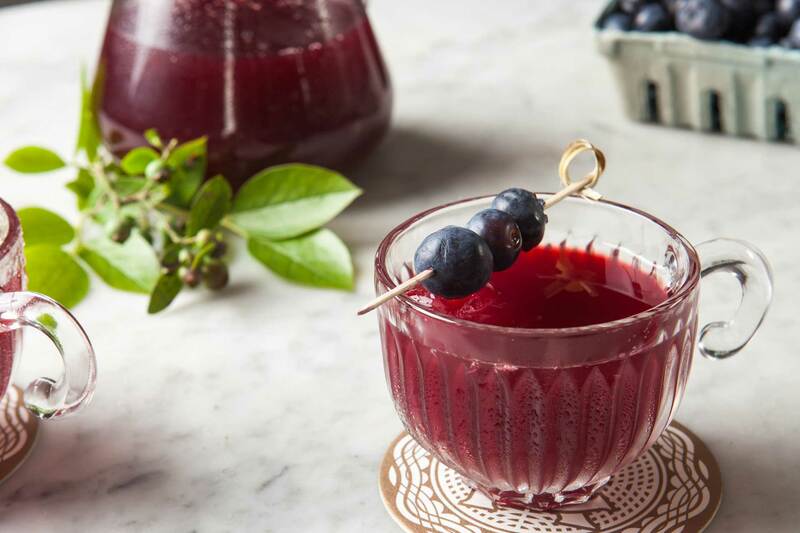 With a few weeks left of the summer heat, these new "Legal Libations" (non alcoholic craft beverages) at 24 Ninth Ave., are a perfect way to celebrate these last few weeks of everything we love about summer. 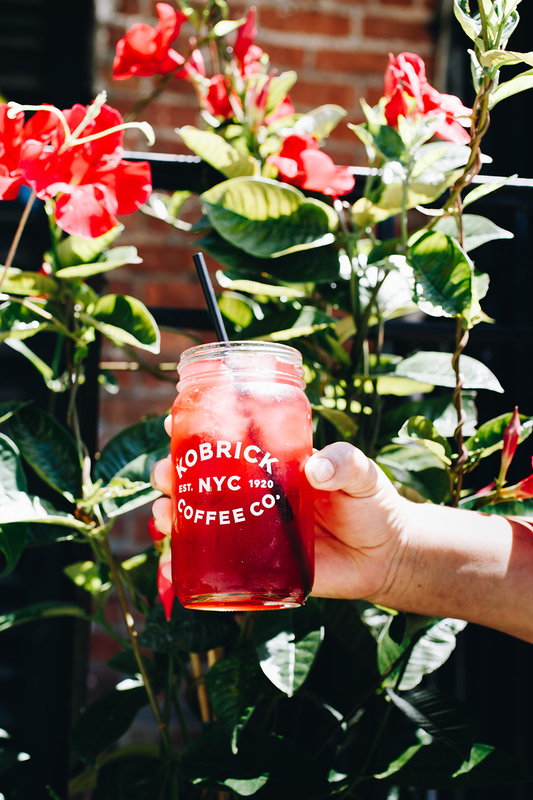 From creamy coffee options, to fruity "coffee cherry", cbd oil, & green coffee extract infusions, we are so excited about this healthy, creative list from our Kobrick Baristas. Last Sunday, July 29th, was Global Tiger Day. 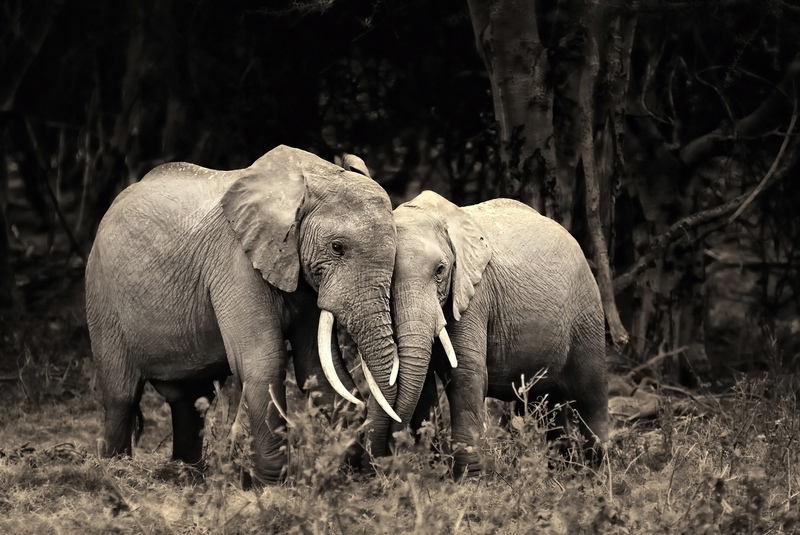 At Kobrick Coffee Co. we are very concerned with the well-being of conserving our earth and all its inhabitants. We donate a portion of the proceeds from the sale of our Tiger Stripe Espresso to the International Fund for Animal Welfare toward the conservation of the endangered tiger population. Our Tiger Stripe Reserve Espresso is our most popular espresso blend, enjoyed and served by many barista and chefs. Use our 10% off coupon code TIGERSTRIPE to try a pound of this or any other selection online through August 9th. Tiger Stripe Reserve Espresso; Deep and complex flavors with hints of dried fruit and chocolate. Smooth, wonderfully aromatic, full bodied richness. Since 2003, Blue Sky Bakery owner's Erik and George have been batching muffins that are a true New York City treat. 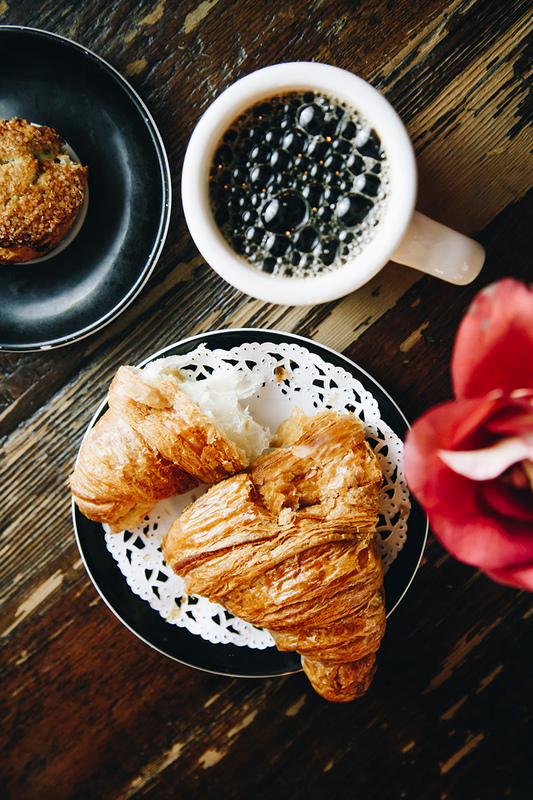 At their two Brooklyn locations (Park Slope and Crown Heights) you can treat yourself to fresh baked muffins filled with fresh cut ingredients such as peaches or cranberries, a marbleized bread pudding, famous banana bread, or a huge amazing chocolate chip cookie. All of these selections can be paired with a Kobrick Coffee of your choice such as our Kiss of Africa Blend, or a Tiger Stripe Espresso Beverage. You can also pick up a bag of our beans to brew at home. Use coupon code BLUESKY for free shipping on $50 or more through July 27th. Cheers to a blue sky kind of summer! Blue Sky Baked goods are delivered daily to 24 Ninth Ave., NYC. Making a small batch of fresh refreshing iced tea at home is simple. You can choose your favorite hot tea and try it cold! Add 3 bags of hot tea to 1 cup of hot water. Read the steep time listed on the package (different for each selection) and use a timer to steep for recommended time. Remove the teabags and then add 2 cups of cold water over "tea concentrate". Pour into a glass over ice and refrigerate the rest of the batch to use within 24 hours. It's always better to make smaller batches more often, but use these proportions, and scale them up to fit your iced tea pitcher. As weekend plans are set, and fireworks shows are in the "works", we are celebrating the 4th of July! 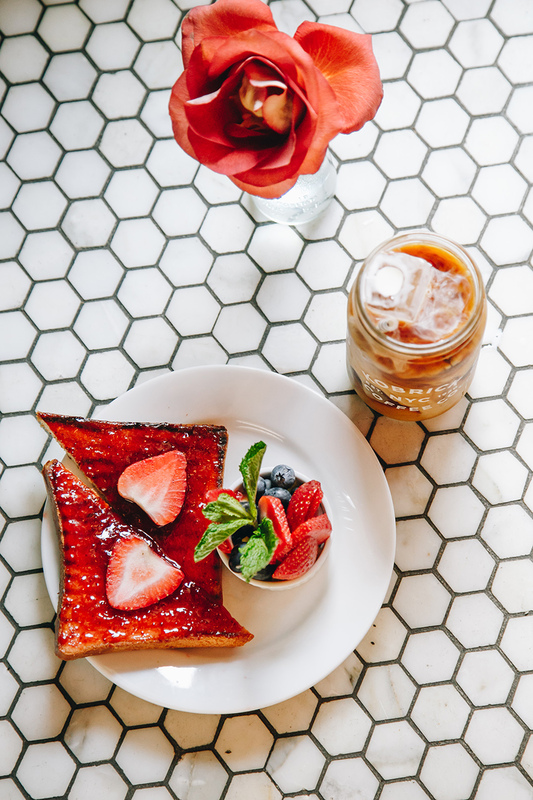 At 24 Ninth Ave. in NYC , you can enjoy delicious coffee, along with a fresh berry dessert with in-house batched Tiger Stripe Espresso whipped cream, and cold refreshments like Steven Smith's Big Hibisucs Iced Tea. We wish you a happy, fun and sparkling 4th of July! Fair Trade Organic Colombian Anei - notes of fruit, hazelnut and cacao. Sumatra Purbatua - blackberry, chocolate, tropical fruit, caramel, cherry. Ethiopian Sidamo Guji - vivid blackberry and blueberry notes. Broadway Lights - mellow spice, citrus and chocolate. Many light roasted selections, such as these, offer notes of summer fruit. Next to fresh picked berries, or delicious pastry, these selections are a wonderful pairing any time of day. We wish you a Happy Father's Day Weekend! We wish you a Happy Father's Day Weekend! 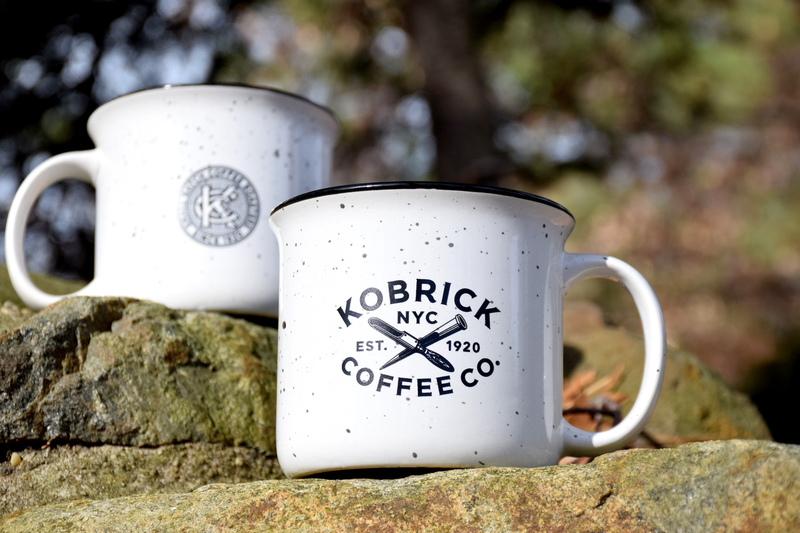 10% off our Kobrick Coffee Cups, Mugs & Tumblers. No coupon code needed. To get free shipping use DADSDAY through June 18 for $50 or more. Choose UPS Ground Shipping Option. 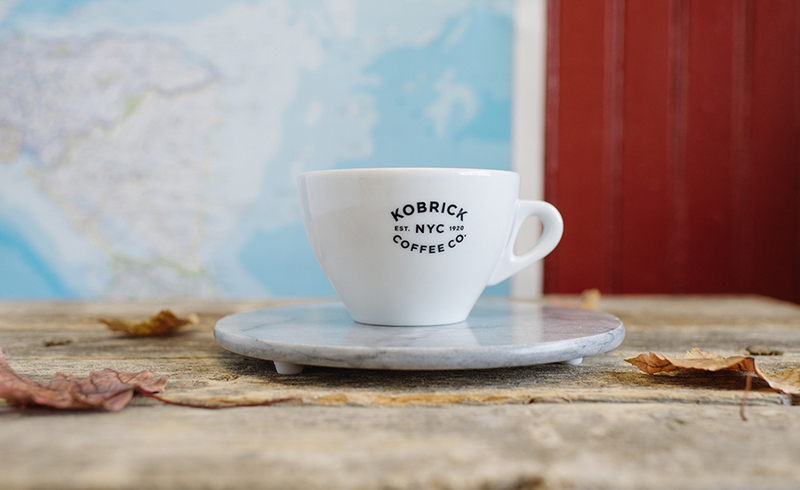 In addition to free shipping this weekend, we have 10% off our Kobrick cups. A great option is our 20 oz. tumbler. Available in black or white, they are lightweight and durable. The double-wall stainless steel tumblers are copper vacuum insulated to keep your beverage hot or cold for hours, plus it prevents condensation on the outside of the tumbler. Enjoy every morning with the special Dads in your life... Happy Fathers Day! Free UPS Ground Shipping with coupon code DADSDAY through June 18 for $50 or more. Put together a custom gift for the great Dads in your life. Coffee by the pound, such as our True Mocha Java Blend and Accessories such as Brew Gear, Tee Shirts, Mugs, or Hats. True Mocha Java Blend - A classic blend of Yemen Mocha and Indonesian Java Estate coffee. A staple of the international coffee house scene for centuries, with a fruity, flowery complexity and rich body. Cold Brew at Home in a French Press. 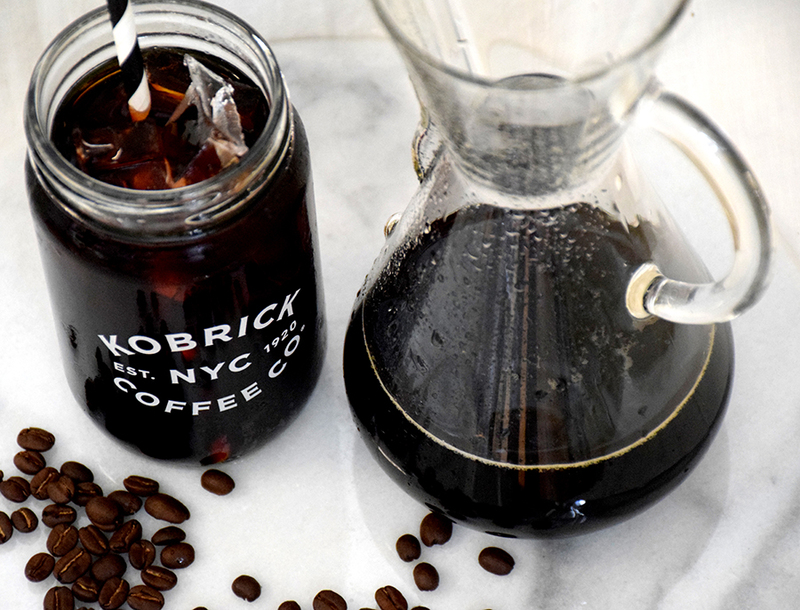 Click here for our Cold Brewed French Press Brew Instructions. Two great cold brew selections are the Broadway Lights Blend and the Ethiopian Sidamo Guji (10% off this week, no coupon code needed). 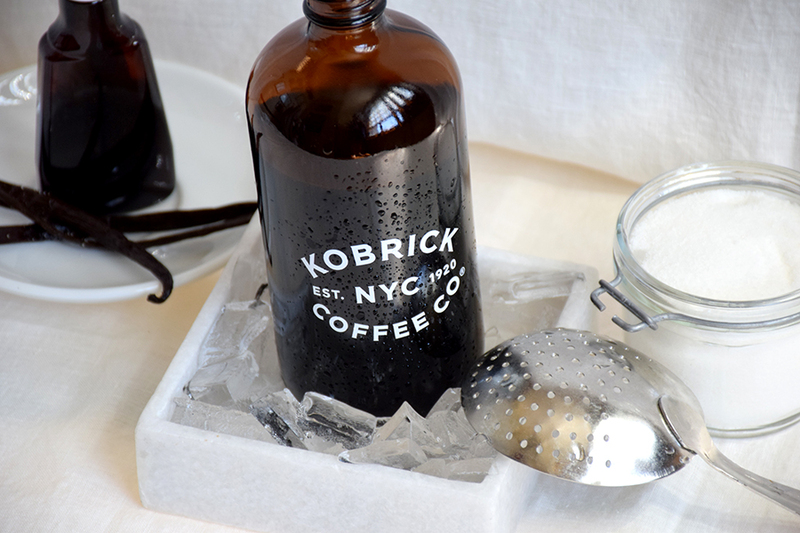 Making it at home is easy and the best way to get super fresh cold brew coffee. After brewing, you can pour it into a separate container and store in the refrigerator to enjoy for 1-2 weeks. 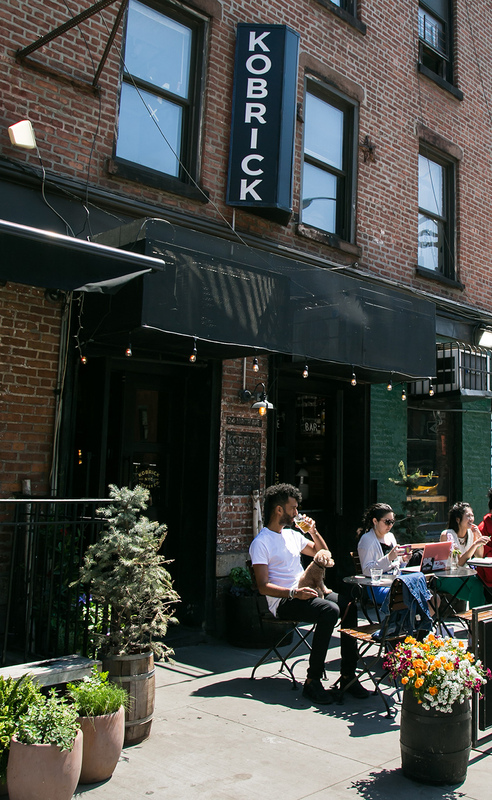 Celebrate Memorial Day with Coffee Cocktails at 24 Ninth Ave., NYC. 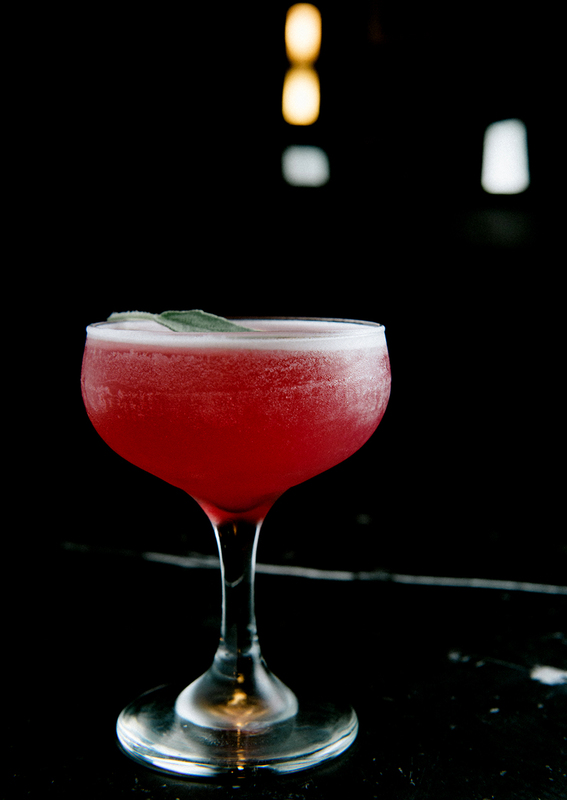 Try a house favorite like our 3 Hour Kyoto Negroni; London Dry Gin, Sweet Vermouth, Campari, Kobrick's Kenya. This cocktail is slow dripped on our bar for 3 hours in a Kyoto Cold Brew Dripper over our delicious Kenya. 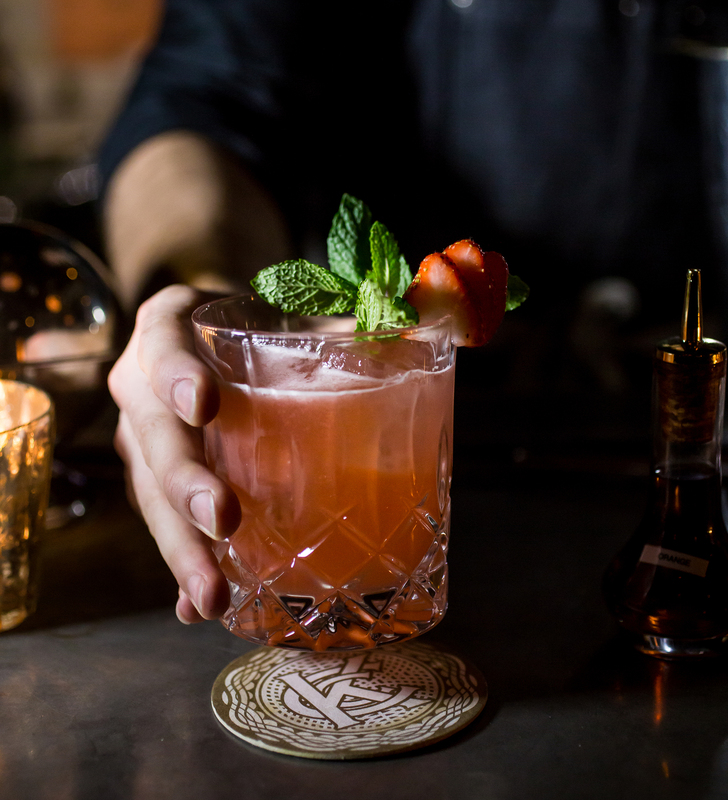 In the glass it's refreshing with the perfect amount of sweetness... a wonderful summer sipper. We wish you a great Memorial Day Weekend! Summer is just a few weeks away and we're looking forward to more warm sunny days and all the delicious treats the season brings. 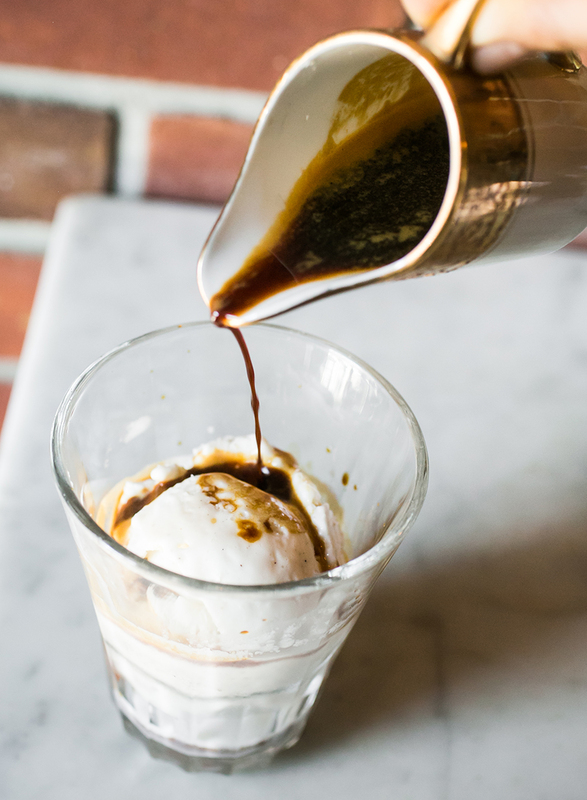 Pictured above is our Tiger Stripe Affogato at 24 Ninth Ave., NYC; a fresh shot of Tiger Stripe Reserve Espresso poured over our creamy, locally batched Vanilla Gelato. Here, we also have our custom house Tiger Stripe Reserve Gelato! 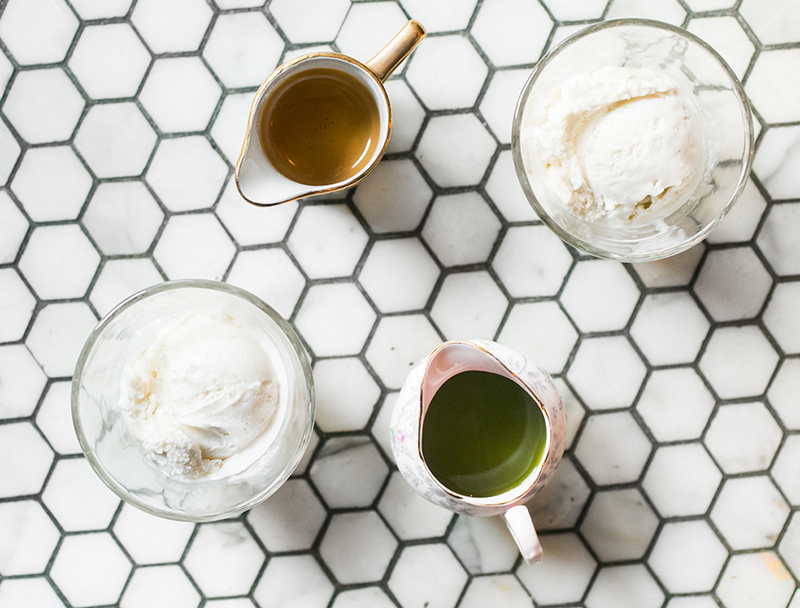 Make one at home, with your own favorite gelato or ice cream, with our Tiger Stripe Reserve Espresso, 10% off this week only. 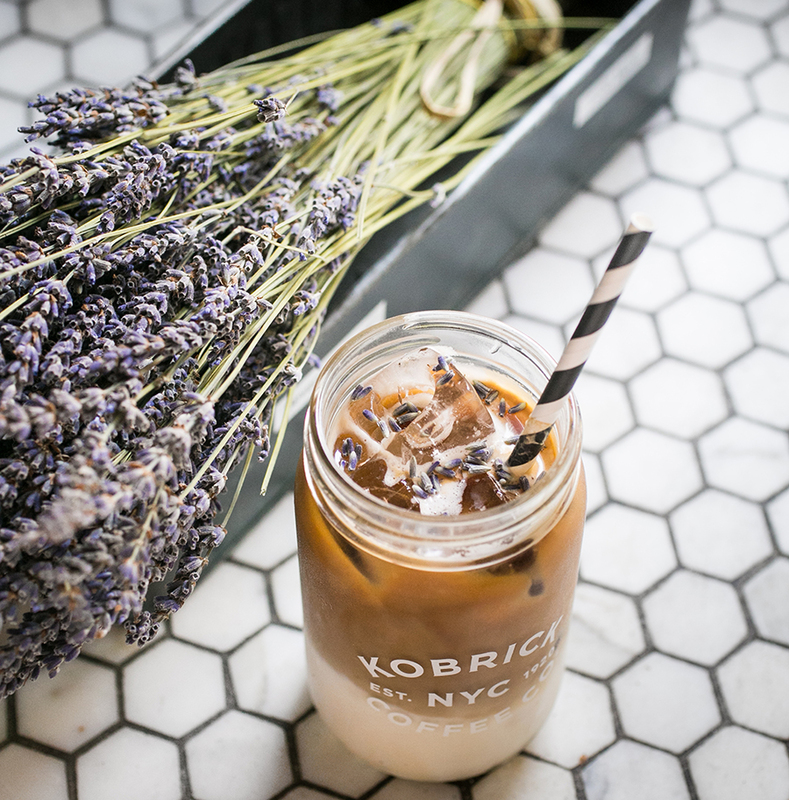 This Sunday join us to celebrate Mother's Day with brunch at Kobrick Coffee NYC or stop by to try our Lavender Honey Iced Latte special. Also, we have free shipping online for orders of $50 or more through May 20th with coupon code CHEERSMOM. Some wonderful single origin recommendations for this spring season include our Burundi Kibenga, Kenya AA, Sumatra Mandheling Fair Trade Certified Organic or the Tanzanian Peaberry. 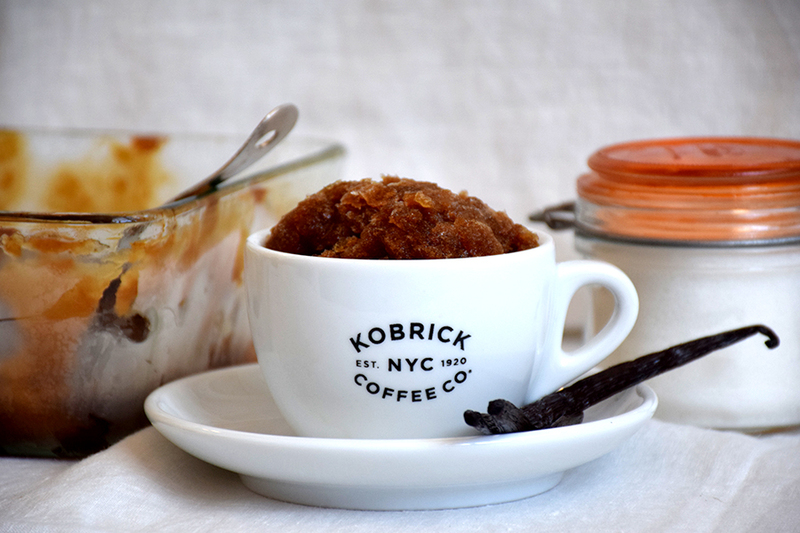 We are celebrating Cinco de Mayo at Kobrick Coffee NYC this Saturday with our coffee cocktail; The Mexican Jumping Bean. 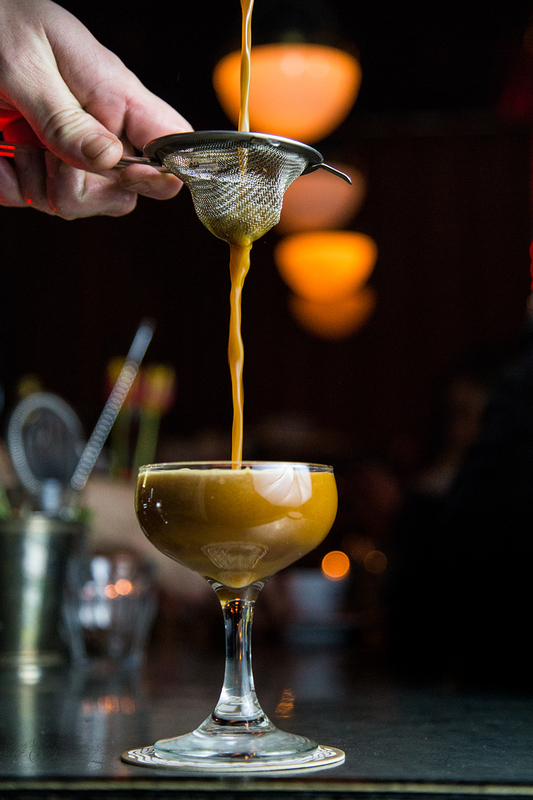 This cocktail combines reposado tequila, our Tiger Stripe Reserve Espresso, Amer China China, & Agave Nectar. Also, we are offering our Mexican Fair Trade Certified Organic at 15% off, this week only. Bright, clean flavor and rich aromatics distinguish this Certified Organic coffee. Medium body and pleasant acidity. From bean (seed) to cup water plays an extremely important role in the holistic coffee process. On the farm, rain is one of the most important elements needed to grow healthy plants which will, in turn, produce excellent tasting coffee. In addition, rainwater gives the farmers the ability to harvest water to use throughout the dry season and in their nurseries. During cupping, the process when we taste and analyze the quality of our coffee, we mix water with ground coffee, and if the water doesn't taste clean, it will disturb the flavor profile of the samples. 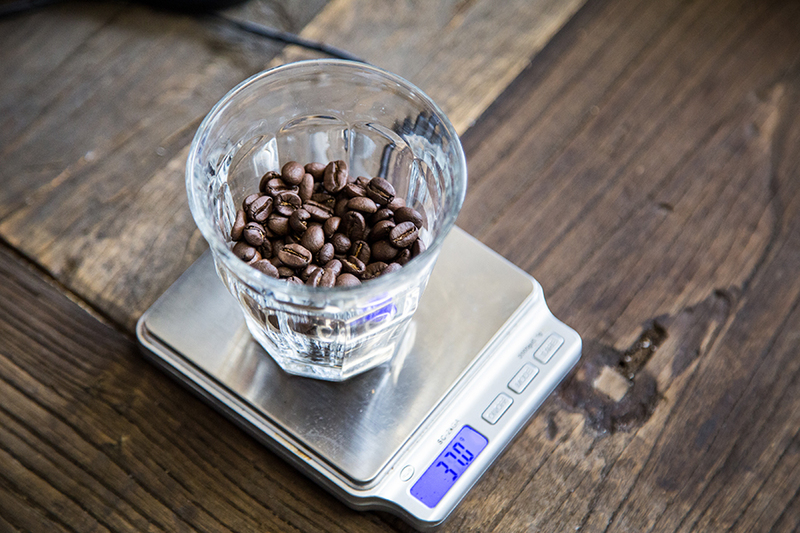 Then, while brewing coffee, there are specific scientific elements in water quality, such as pH and alkalinity, that need to be met in order to pull the perfect brew or espresso shot. Conservation and awareness around the importance of clean water is something we don't take for granted as coffee roasters, blenders, and brewers. All coffee beans grow inside a coffee cherry. The evergreen coffee shrub flowers, then the flowers fall and green cherries develop, which turn bright red, or sometimes bright yellow, as they ripen. When they are fully ripe they are ready to be hand picked. 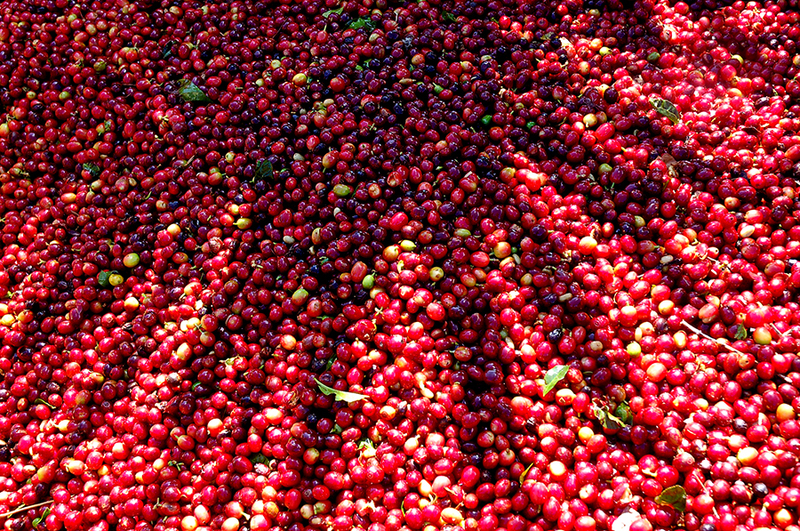 After picking, the coffee cherries are weighed at the closest designated weigh station. Pickers and farmers are paid for the weight of the cherries. Next, they are transported to the processing facility (many times separate from the farms). 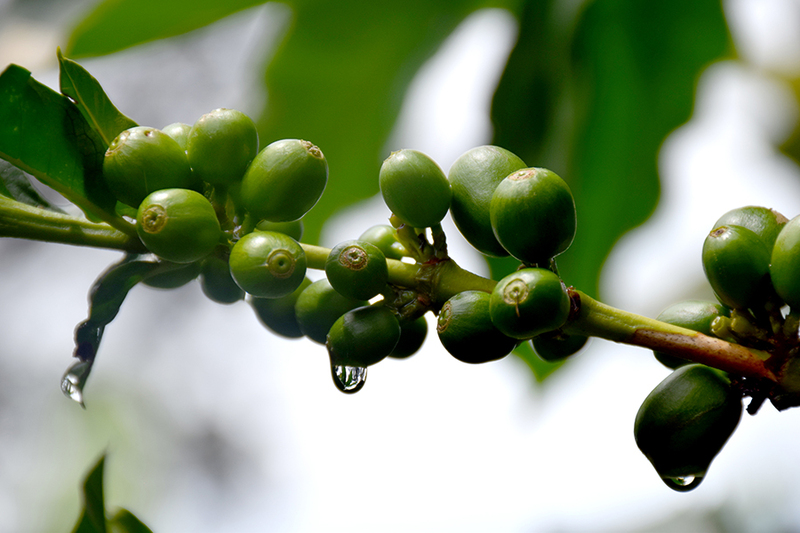 Most of the time each coffee cherry holds two beans (unless they are "peaberries" which are much less common, but form one rounded bean in each cherry). Note: There are many variations to the process described here. This is a general overview of the life of the coffee cherries. Use coupon code APRIL for 10% off online, through April 12th. 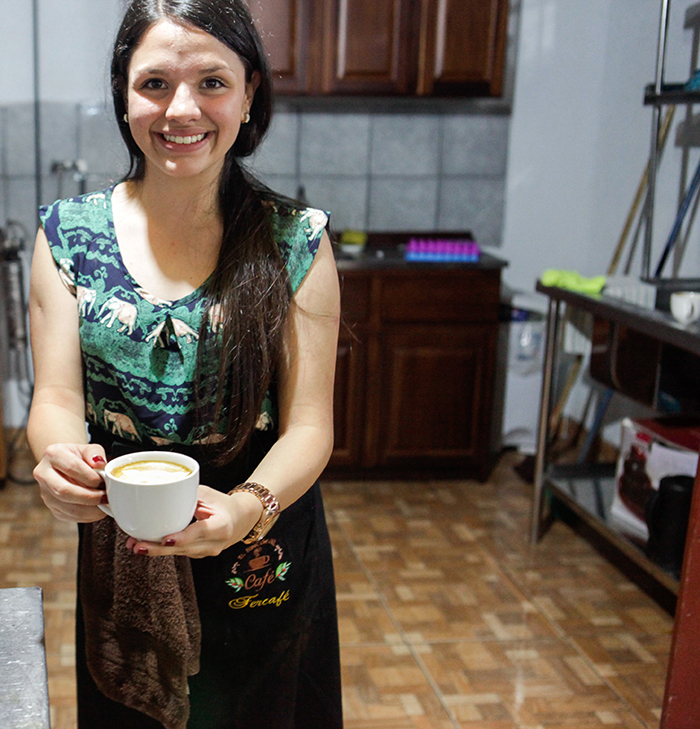 Over the past decade a few coffee processing methods have gained popularity. You may have heard these agriculture buzz words without knowing what they mean: Washed, Honey and Natural? • Washed coffee looks clean & is usually pale green in color. This means that the coffee is washed in water and then dried, naked from its coffee cherry and pulp. This is the most common processing method. Most of our coffees are washed. • Honey Process offers a cup that is not quite as fruity as natural, but very sweet. 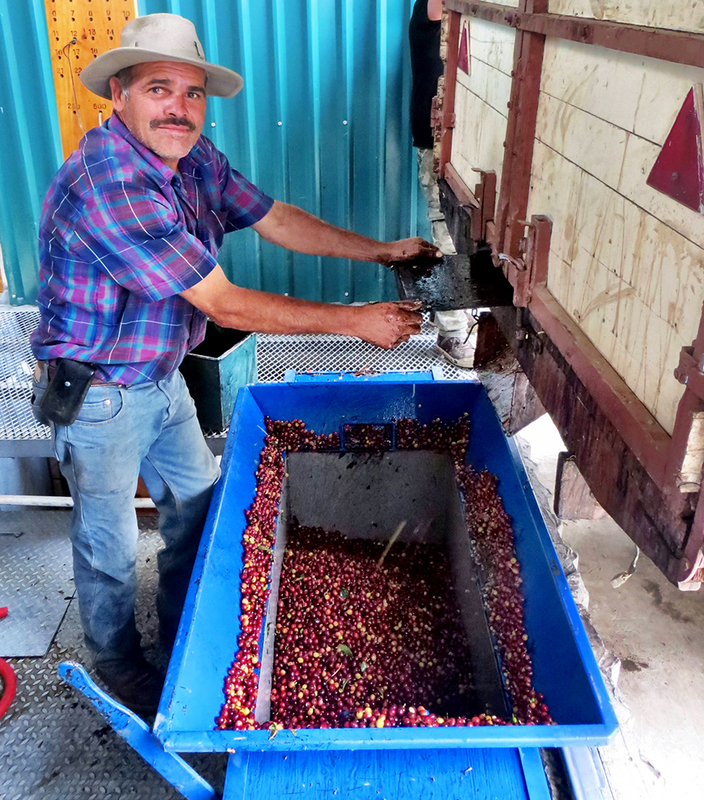 The coffee beans are depulped and then they are dried in the sweet mucilage that surrounds the bean, located inside the cherry's outer pulp. Try our Costa Rica Finca El Mirador Honey. • Natural Process (dry process) the coffee cherry is left on the bean while it dries. This adds the natural fruit flavors from the cherry to the flavor of the coffee bean. (generally most eco-friendly) Try our Ethiopian Sidamo Guji. If you are celebrating Easter or Passover this weekend, we wish you a joyous time! Our springtime free shipping continues... Use coupon code SUNSHINE for free shipping on $50 or more through the end of March. Also, just in; this Colombian Anei Fair Trade Certified Organic. In the cup, nice body, and crisp with notes of fruit, hazelnut and cacao. 10% off online this week - no coupon code needed. Use coupon code SUNSHINE for free shipping on $50 or more through the end of March. St. Patrick's Day in New York City is always a high spirited event. There's the festive parade, and restaurants and pubs fill with people dining & drinking, all dressed up in green, celebrating Irish culture. Above, is the Loca Mocha. 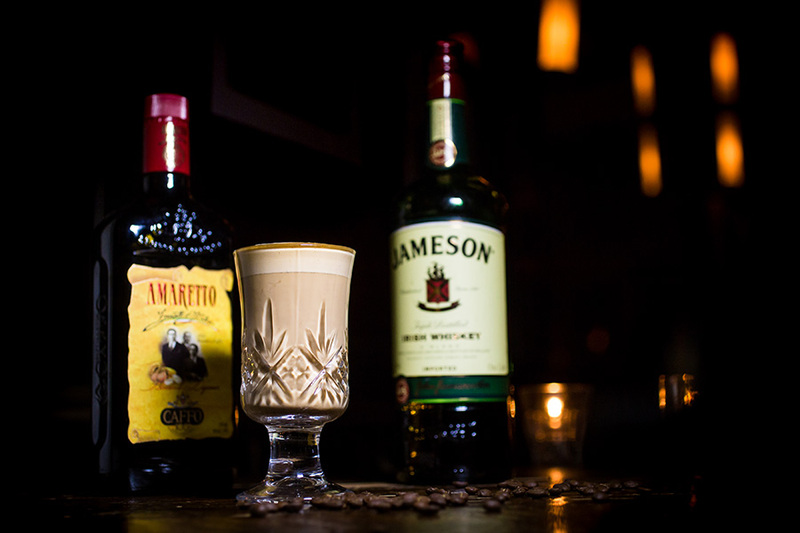 To make this, we shake Ancho Chilie liqueur, Jameson Irish whiskey, chocolate milk, cold brew, and Hella aromatic bitters. 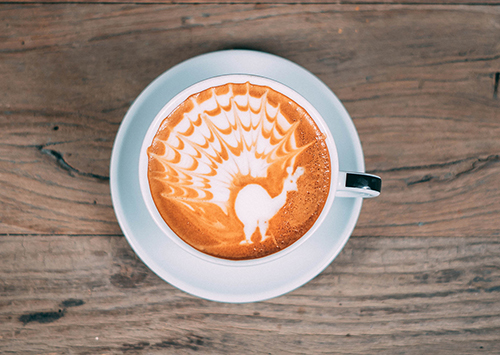 Shown below is the Lucky Spike Latte. This is a latte spiked with Irish whiskey, amaretto and espresso sugar (4 part sugar, 1 part brewed espresso). Here's to shamrocks, leprechauns and the "Luck of the Irish" - Cheers! 10% off, this week only. Use coupon code BLOOMIN through March 14th. There's a snowstorm in NYC today, but spring is just around the corner with blossoms waiting to bloom. 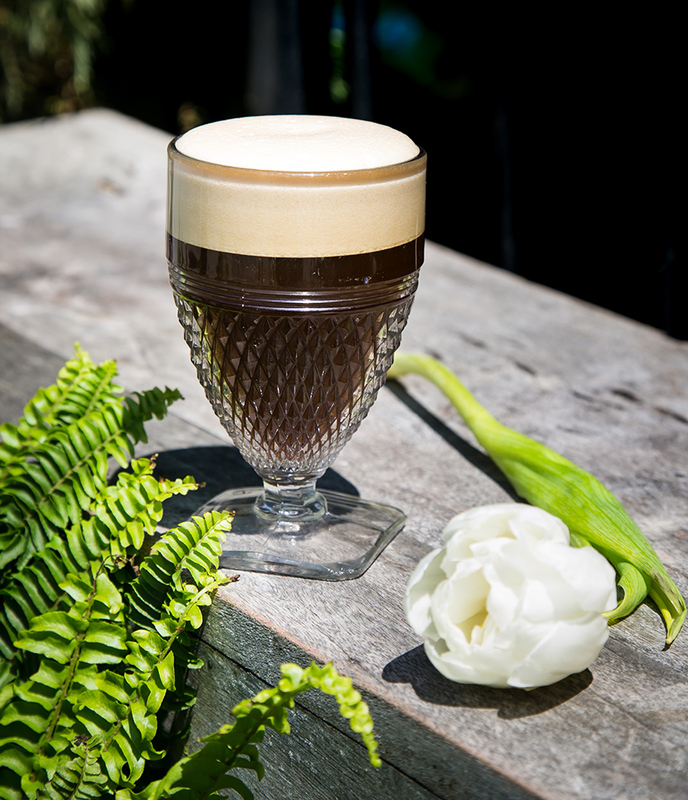 We celebrate the upcoming season with our very fresh coffee "bloom". As the gasses release from just roasted & ground coffee, while hot water makes initial contact during the brewing process, you can see "the bloom" which is a graceful bubbling, rising reaction. 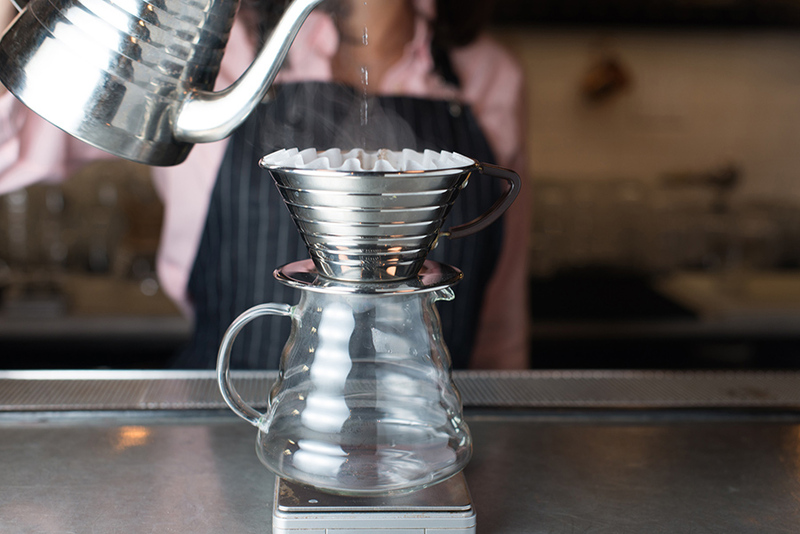 Know that we roast your coffee to order, so if you grind fresh and brew with a pour over device such as the Kalita (shown here), you can witness the bloom. It's a very beautiful process. Happy Bloomin'! Stepping into a cafe is a sensory experience. 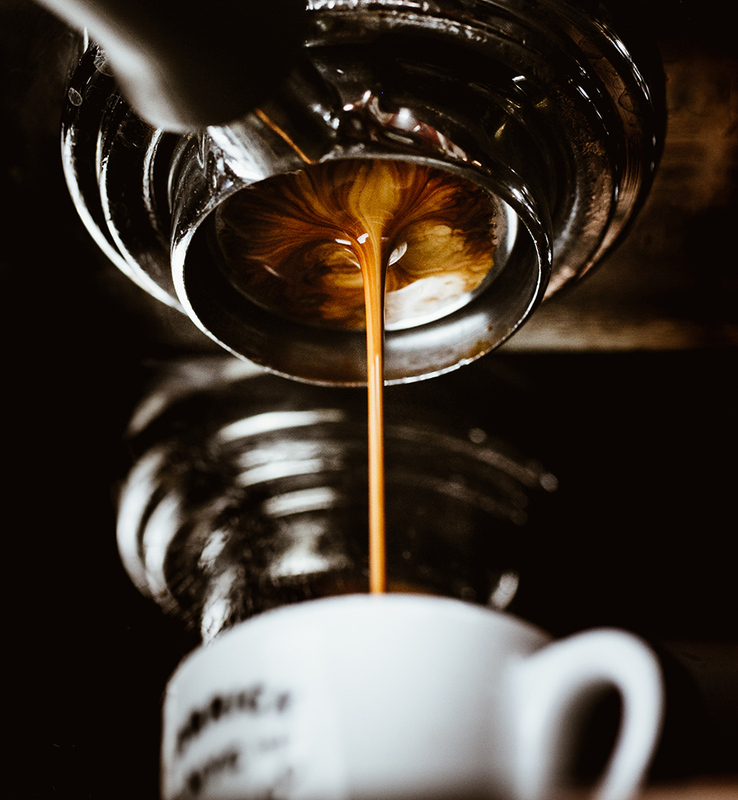 Barista are grinding coffee & steaming milk as passerby sip their just finished hot lattes.The key to perfecting these lattes can be simplified into the two key ingredients; a fresh shot of espresso with golden crema and properly textured premium quality milk. 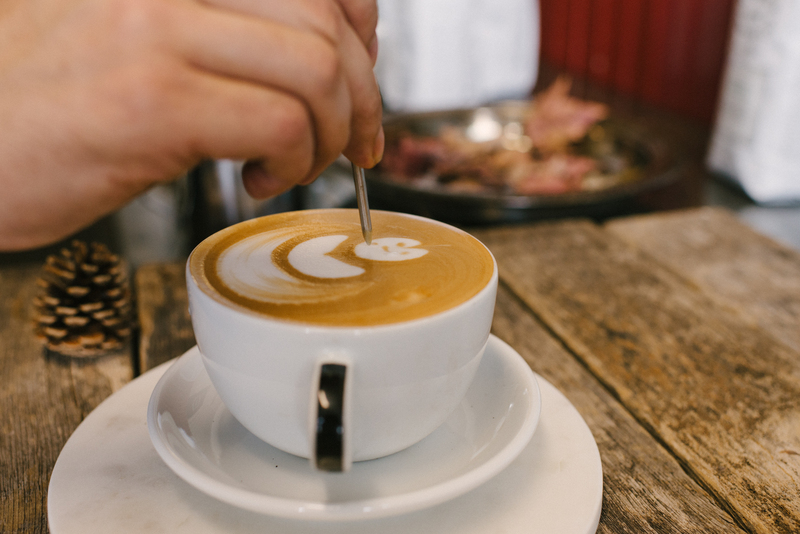 Our house lattes are made with whole milk, produced by Hudson Valley Fresh farmers co-op. 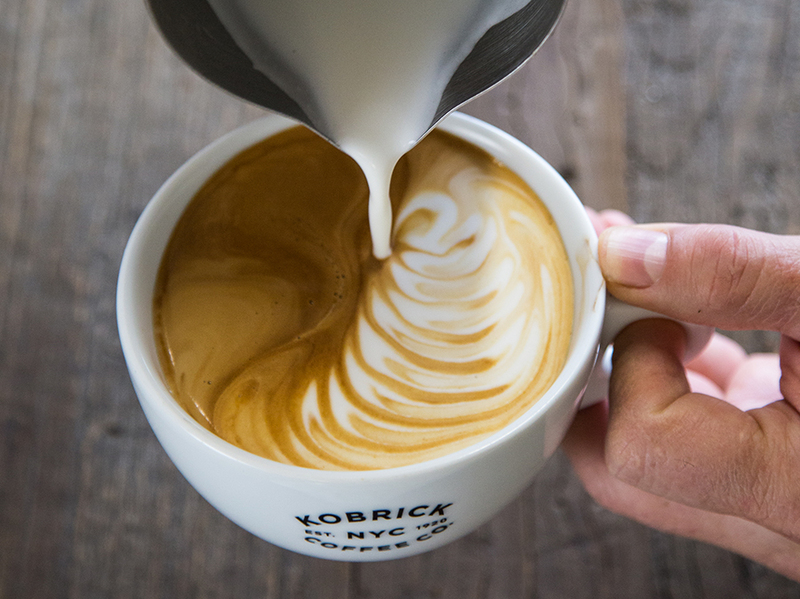 Local to NYC, the difference in taste delivers a sweet creamy microfoam when properly steamed. This microfoam is poured over the espresso with precision creating a well balanced mix of espresso and milk. 10% off our online store with coupon code TOOLS through February 28th. 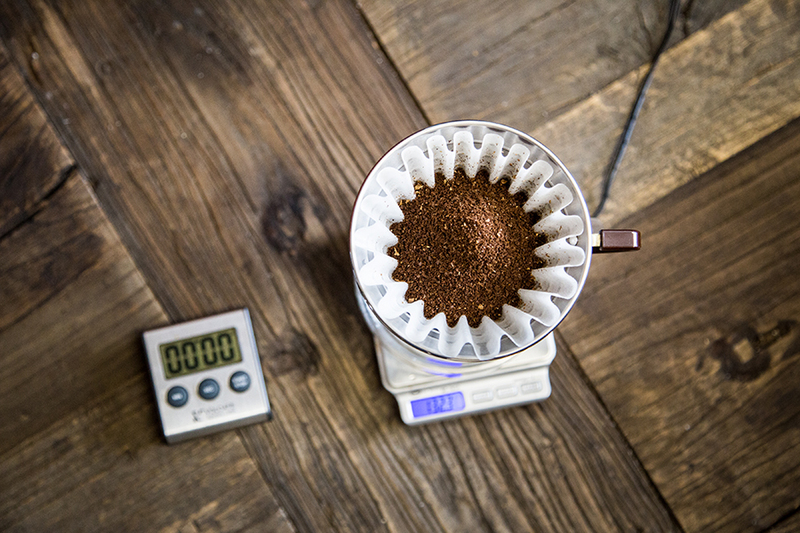 You can brew a better pot of coffee by simply adding a burr coffee grinder and a kitchen scale to your coffee tool kit. Grinding fresh allows you to extend the life of the beans, and the scale helps to brew a more precise cup. Check out our Learn page for more details & brew guides. 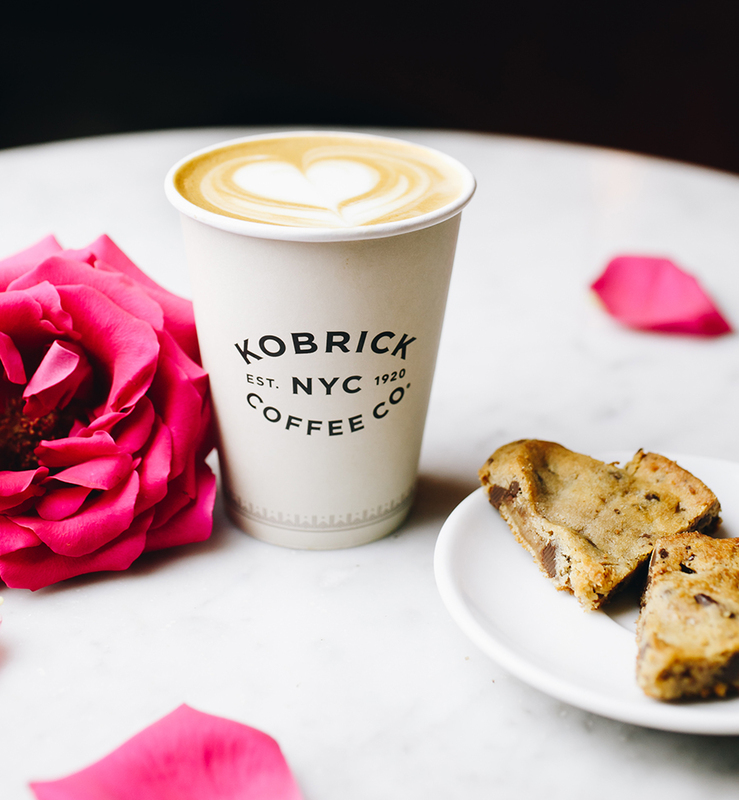 In 1920, when Samuel Kobrick began roasting coffee on the waterfront of NYC, the city was blossoming with a romantic culture that built the foundation of energy New York City still emanates today. 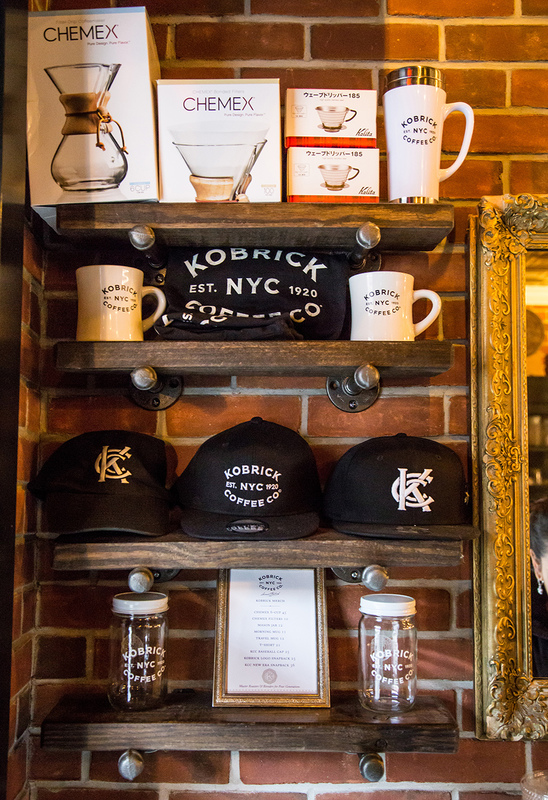 Creating a vibe that builds upon this at 24 Ninth Ave. was a natural fit for the Kobrick baristas, our products and our legacy. 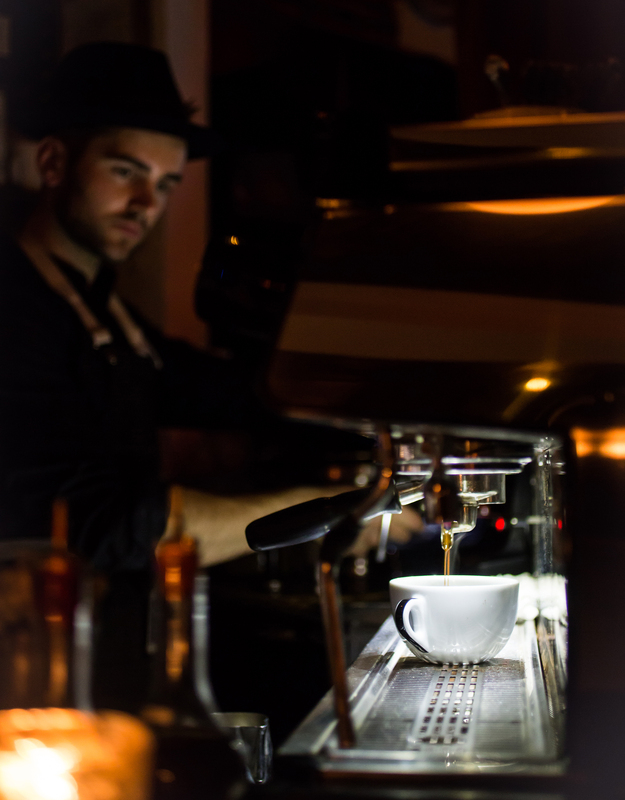 The lighting, in step with the music, coffee grinding, milk steaming, cocktail shaking sounds; builds an energy that is lively yet calming. 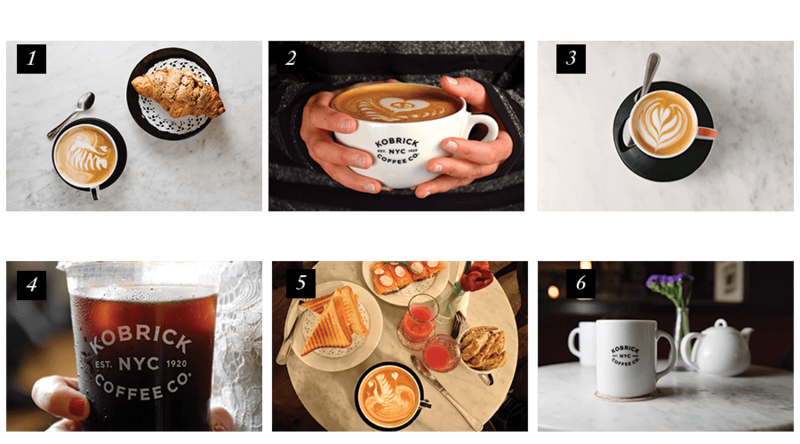 All of our menu offerings are crafted with a passion and love for the experience of bringing together coffee and cocktails. Photo above is building our "Bouquet Latte" and here is our "Lovinjito" Valentine's Day special cocktail. We hope you have a romantic Valentine's Day! All time favorite gifts are ones that can be used every day. 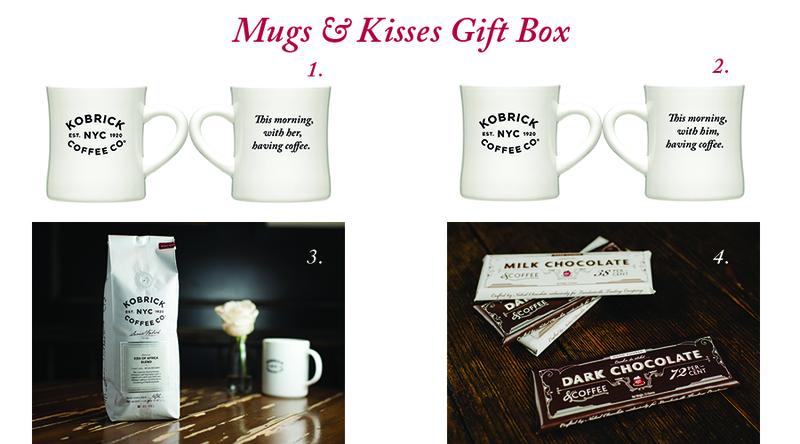 We put together the Mugs & Kisses Gift Box which include mugs that remind your favorite person you sip morning coffee with how you feel. Our new sturdy 15 oz. ceramic mug is a perfect size for a cup of coffee. They have a cozy feel during these cold winter months, and are reminiscent of summer campfires. 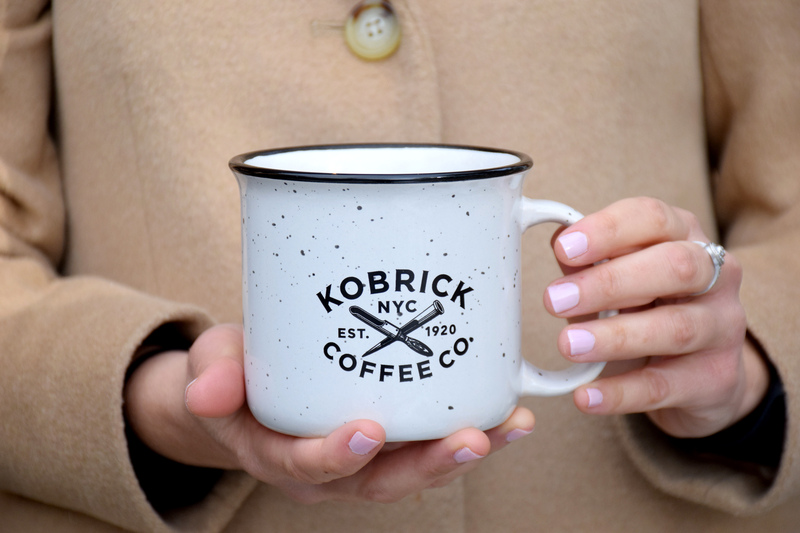 This week only, Kobrick Cups are 15% off online! What makes a great house blend? Great for everyday and any time of day, a smooth, full bodied selection that can stand up to milk, such as our Kiss of Africa. Rich, elegant flavor, aroma, and a bold complexity are hallmarks of this blend; the name is inspired by its distinctive African origins. 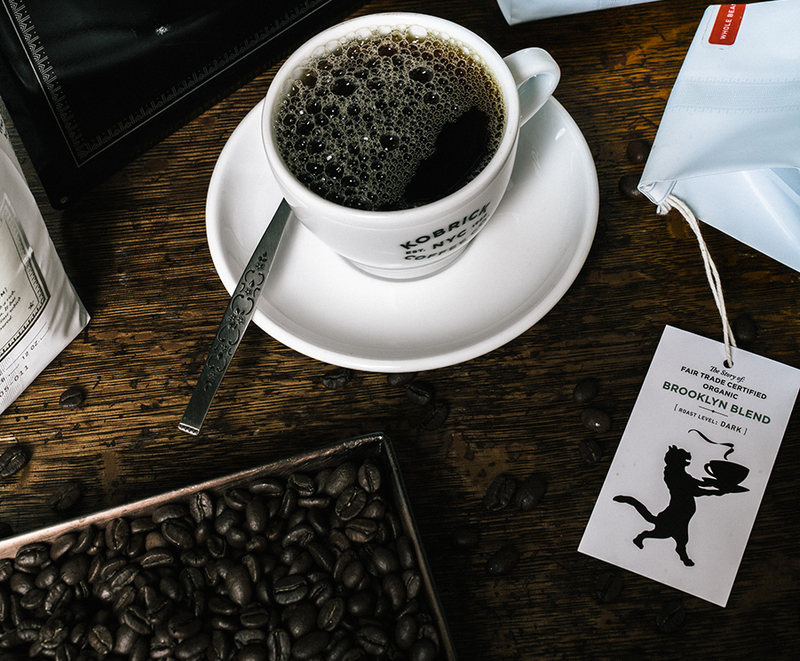 Superb offerings from Kenya and Ethiopia, both hearty and delicate, are blended together with a bright, full-bodied Guatemala, and roasted to a perfect chestnut brown medium roast. This medium roast base is then blended with a caramel-sweet dark roast Indonesian. The lighter roasted components illuminate bountiful nuanced notes of fruit, citrus and spice, while the dark roast Indonesian adds even deeper body and a creamy layer of dark chocolate richness to the finish. A bold, nuanced, rich, balanced and complete cup of coffee with a delicious beginning, middle, and end on the palate. 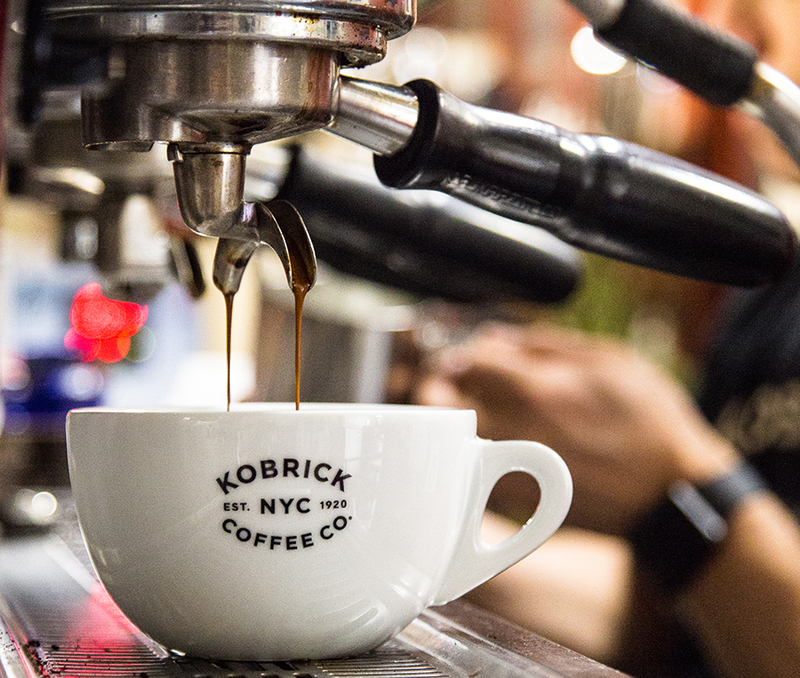 Single Origins now brewing at the pour over bar at Kobrick Coffee Co., 24 Ninth Ave. include the Kenya Muchagara, Costa Rica Finca Mirador , Sumatra Purbatua , and the Ethiopian Yirgacheffe Konga Organic. These selections are available online for a limited time, 10% off, no coupon code needed. Sitting down to enjoy a pour over offering can turn an everyday cup of coffee to a special experience which can transport you a little closer to the coffees origin. It's like a trip in a sip. This week we are featuring our just-in Kenya AA for 15% off. No coupon code needed. 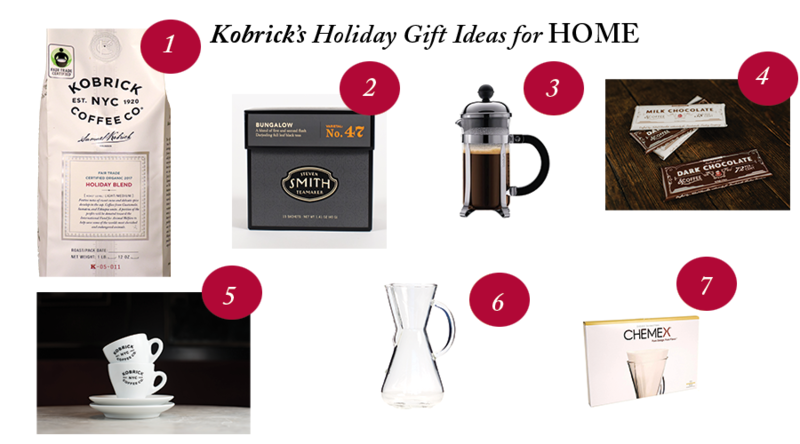 This exceptional coffee is a great way to help start the new year with flavor. We hope you all had a wonderful Holiday! As the New Year approaches, we realize how quickly time can go by & savor our memories of beautiful everyday moments. Cheers to filling 2018 with happiness! 1. Your perfectly paired order. 2. A just brewed latte. 4. A smooth refreshing cold brew in the heat of summer. 6. Sharing a morning cup with someone special. 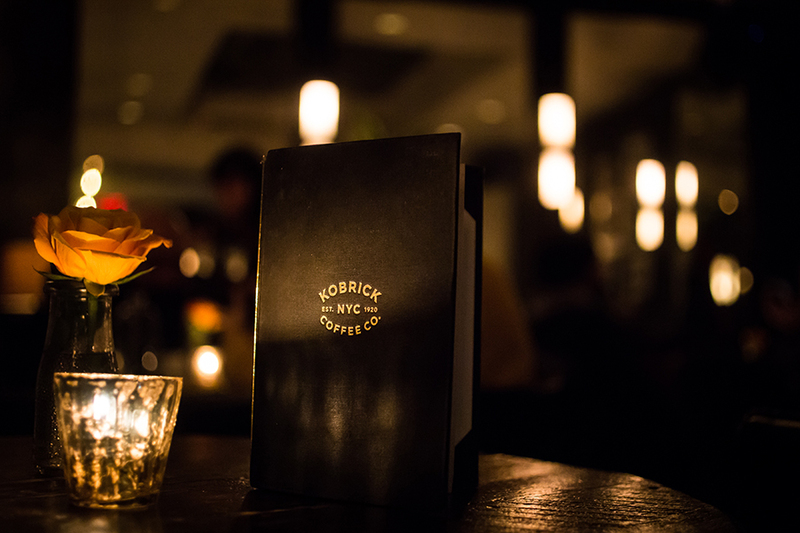 Here at Kobrick Coffee NYC, we have a list of winter cocktails such as the "Sage it Ain't So" to delight in the flavors of the season. If you are local, we invite you to come share in the joy of the season! 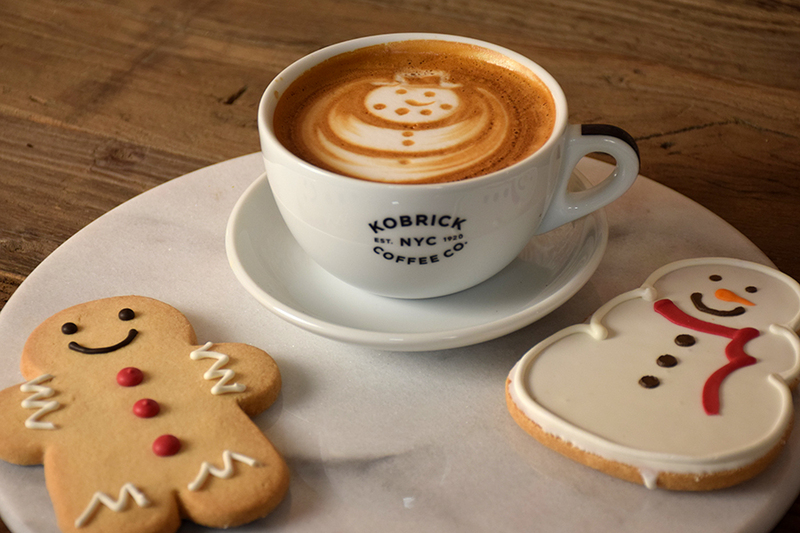 If you are not in NYC, we extend our warmest appreciation (over a cup of just brewed Kobrick Coffee) and wish you continued peace and joy during this wonderful Holiday Season. 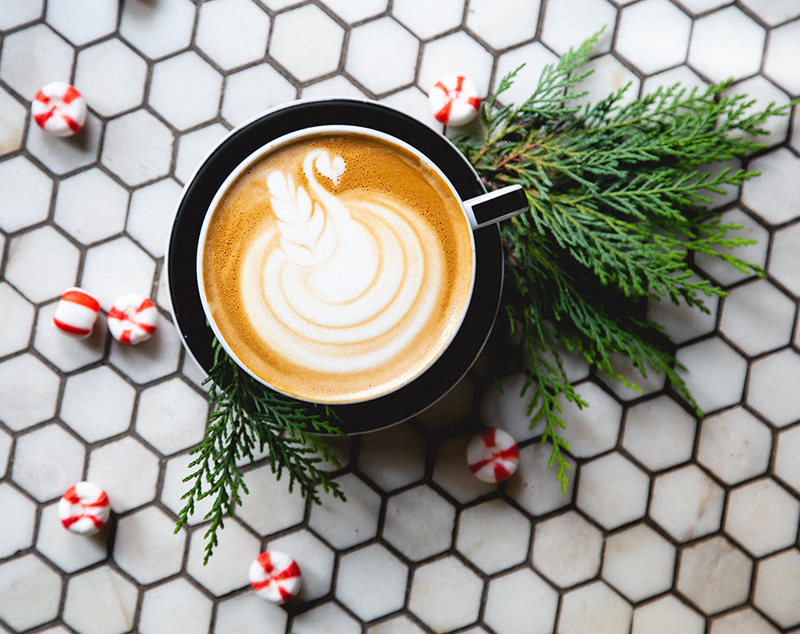 To celebrate a joyful, warm and delicious holiday season we are toasting with our favorite holiday coffees and festive latte designs like this one. The snowman is poured with the three short pours of steamed milk. Then, to make him come to life, details are drawn like the hat, eyes, nose and buttons. Happy Holidays! 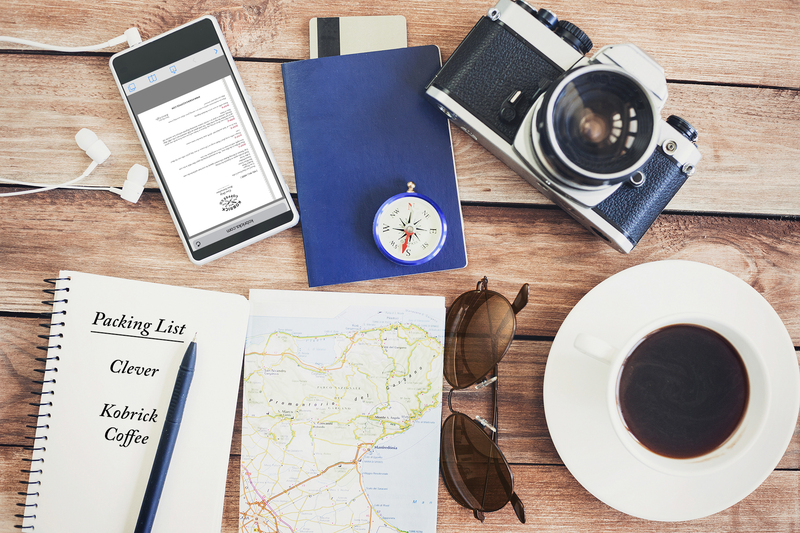 Add your favorite coffee to your suitcase on every trip, with this lightweight, portable brewer... the Clever (15% off). Also, #4 Melitta cone filters are so commonly available. This means all we need to bring is the Clever and a pound of our favorite coffee. Check out the brew video. Click Here For Clever Brew Instructions for all you will need to brew on site. 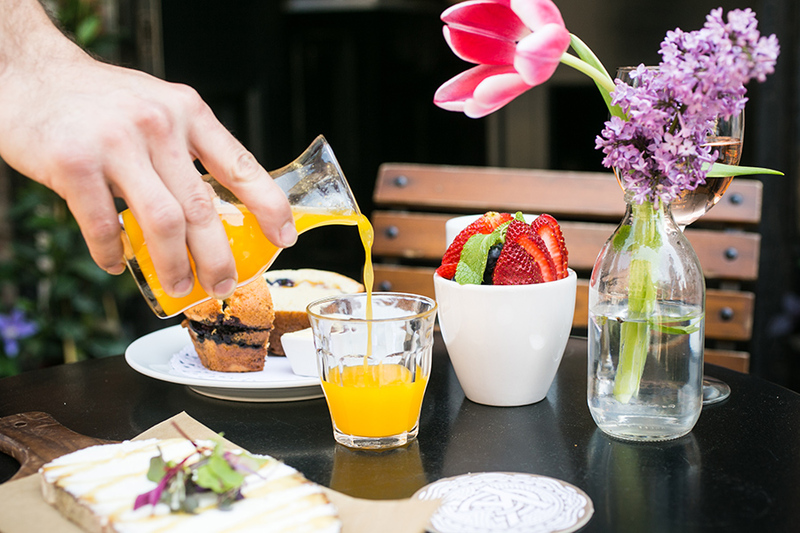 May your table be filled with joy, deliciousness and great coffee. 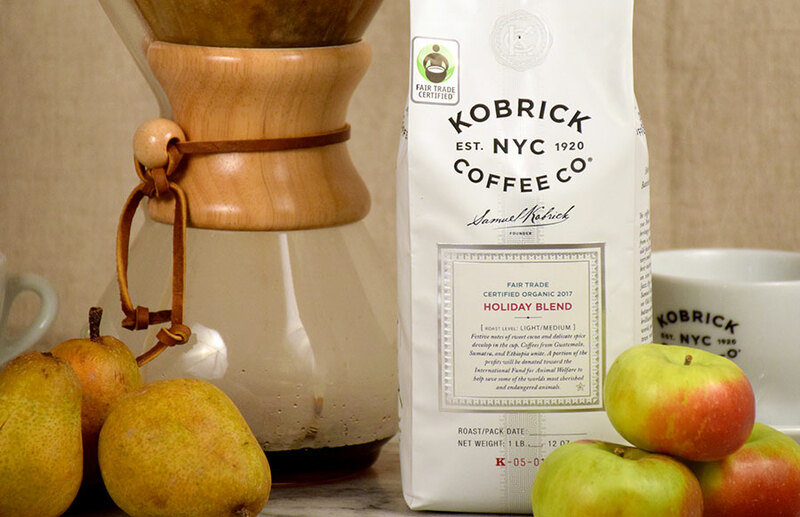 Send us photos to info@kobrickcoffee.com of our coffee at your dinner or dessert table or kitchen counter (maybe even while you are cooking) and the photo winner will get a free pound of Holiday Blend. Also, until November 28th we have Free Shipping for orders over $40 with coupon code TOGETHERNESS in honor of Black Friday, Small Business Saturday and Cyber Monday! Happy Thanksgiving! As Thanksgiving approaches, we begin to think more about what we're thankful for. 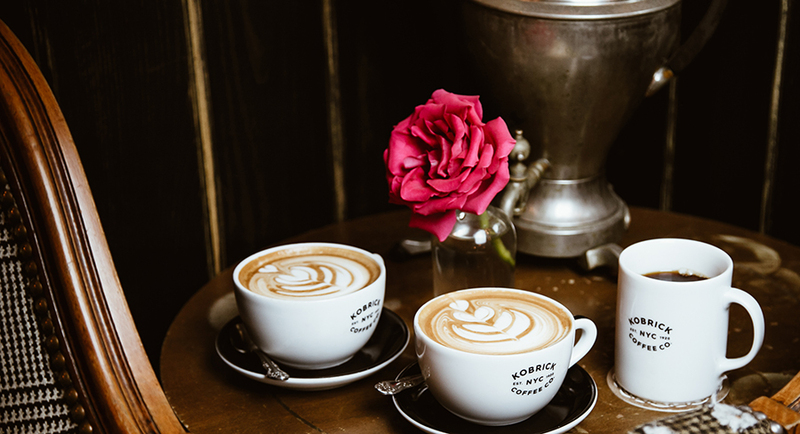 Through our coffee we get the chance to connect with you and for this we want to say thank you! Until November 28th we have Free Shipping for orders over $40 with coupon code TOGETHERNESS. In the spirit of the season, our Holiday Blend 2017 is now available; festive notes of sweet cocoa and delicate spice develop in the cup. 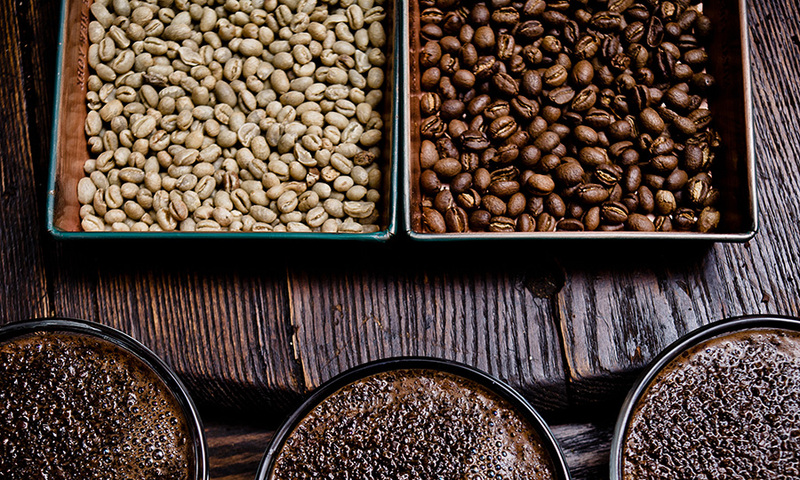 Fair Trade and Organic coffees from Guatemala, Sumatra, and Ethiopia unite. A portion of the profits will be donated toward the International Fund for Animal Welfare to help save some of the worlds most cherished and endangered animals. If you will be in NYC this weekend, join us at the Meatpacking District's Harvest Fest, Saturday October 28th, from 11am - 4pm at Hudson River Parks 14th Street Park. We will be brewing hot cups of our Kiss of Africa Blend and Broadway Lights Cold Brew on tap. Just around the corner from our cafe, the event will include offerings from local businesses in our neighborhood; food and drinks, activities, and a dog costume contest. 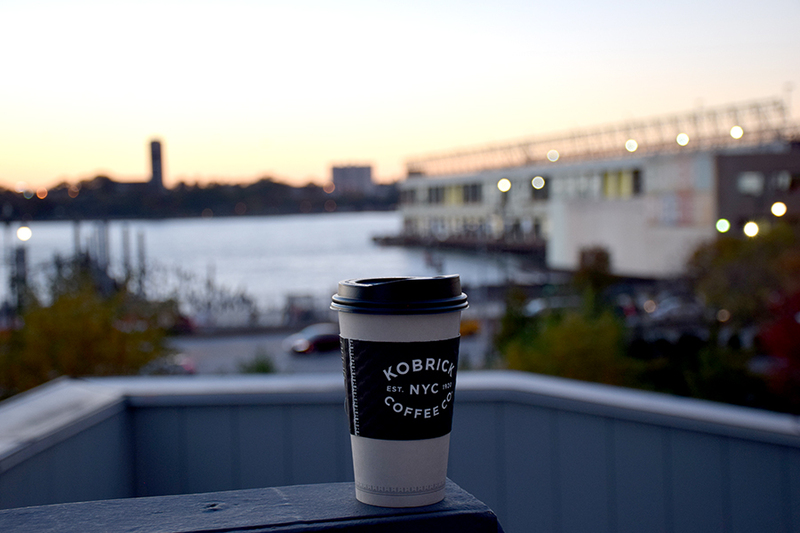 Take a walk on the Highline, come for a cup of coffee or cold brew and then you can head over to our cafe at 24 Ninth Ave. for a coffee cocktail. There's nothing like Autumn in New York! Two roaster favorite, limited time, single origins are 10% off through the end of the month (no coupon code needed). Both are outstanding selections from Africa, light roasted to show off their distinctive notes that pair well with fall flavors! Burundi Kibenga - Vibrant citrus with notes of brown sugar and hints of nutmeg spice. Grown in the Kayanza region at 1830 masl, this Bourbon is fully washed and dried on a raised African bed. 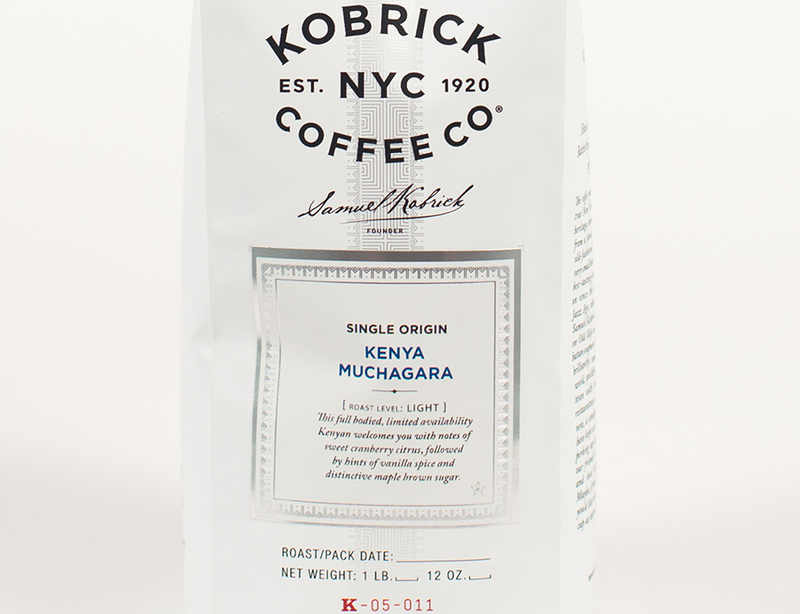 Kenya Muchagara - This full bodied, limited availability Kenyan welcomes you with notes of sweet cranberry citrus, followed by hints of vanilla spice and distinctive maple brown sugar. Our Tiger Stripe Reserve & LMK Organic Espresso is 10% off this week. As the weather gets cooler, we begin to crave the creamy, rich flavors of espresso and the great beverages we can prepare with it. If you're going to your favorite coffee shop daily all these delicious offerings can add up, so a nice option is to be able to brew them at home. We can help you invest in a set up that is reasonably priced, easy to use, and will last for many years. We want to hear from you. Let us know if you're brewing espresso at home, how you are brewing it, and if you're interested in investing in a home kitchen coffee bar... we can help you choose some great equipment. 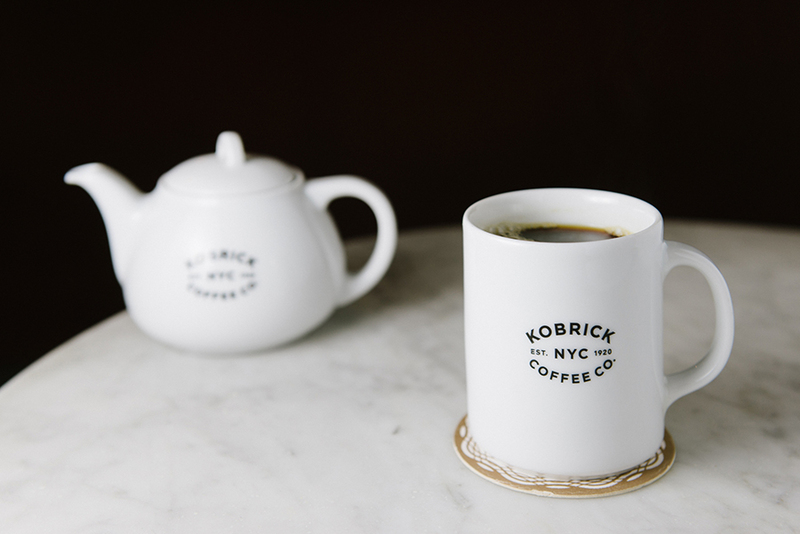 Please send us an email to info@kobrickcoffee.com. Making great coffee and working with thousands of restaurateurs and chefs to brew it with like enthusiasm has been our passion since 1920. So many different generations, backgrounds and personalities working toward a single goal. Each of us share excitement for coffee and a pride in what we do. This is a big factor in what makes our roasted beans... great! We believe in our product, and stand by our coffee, and feel good about what we do every single day. If you want to make great coffee at home, you can. It starts with an enthusiasm to do so. 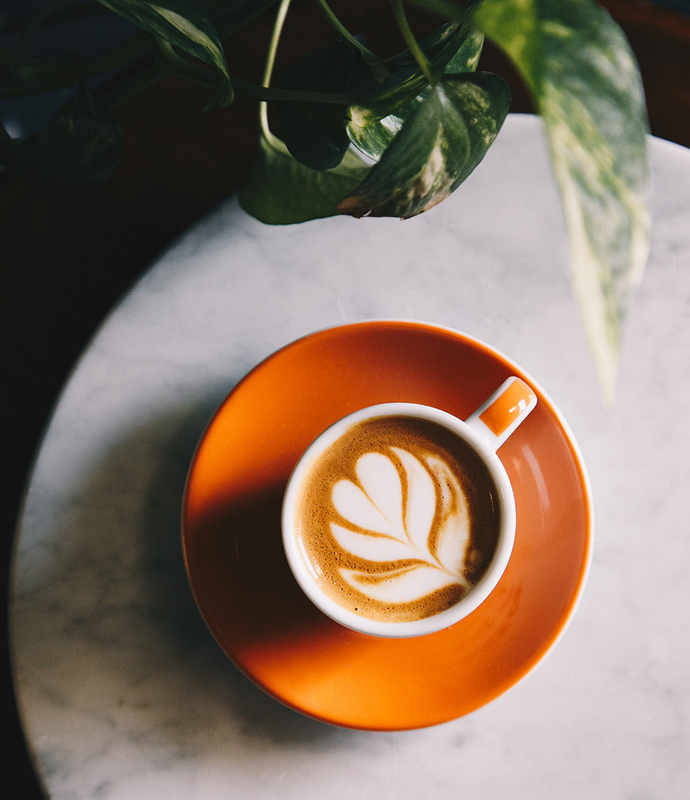 Believe that you can make a cup of coffee that tastes as great as it does at your favorite cafe, enjoy the experience, take pride, and this is the starting point! 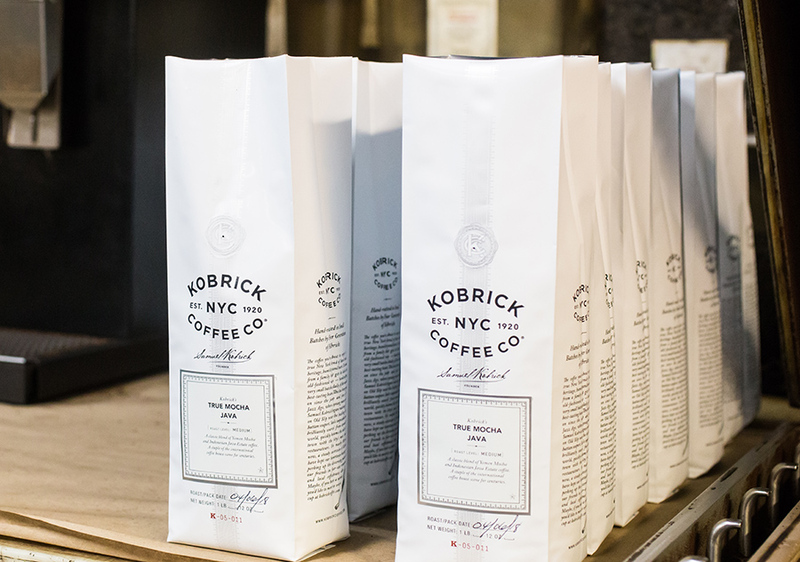 Next, check out our brew guides and ask us any questions at info@kobrickcoffee.com . We hope to hear from you about any home brewing goals you may have. Let's make great coffee together! Happy Coffee Day! Free Shipping! How do you brew coffee at the Kobrick House? In our home kitchen we have a lot of coffee brewing options. 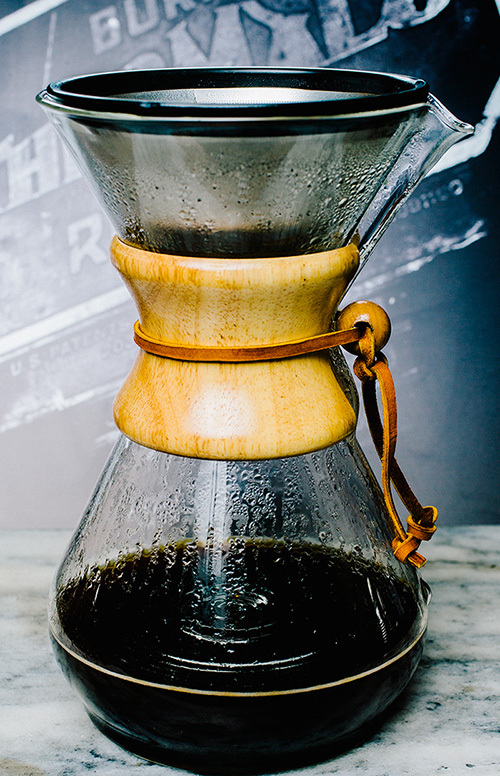 Three of our favorite options are the Kalita, the French Press and the Chemex. Depending on the moment, each is a unique way to brew coffee, resulting in a different taste & experience. When I'm in the mood to try a single origin, any time of day, the Kalita is a great option to brew with. 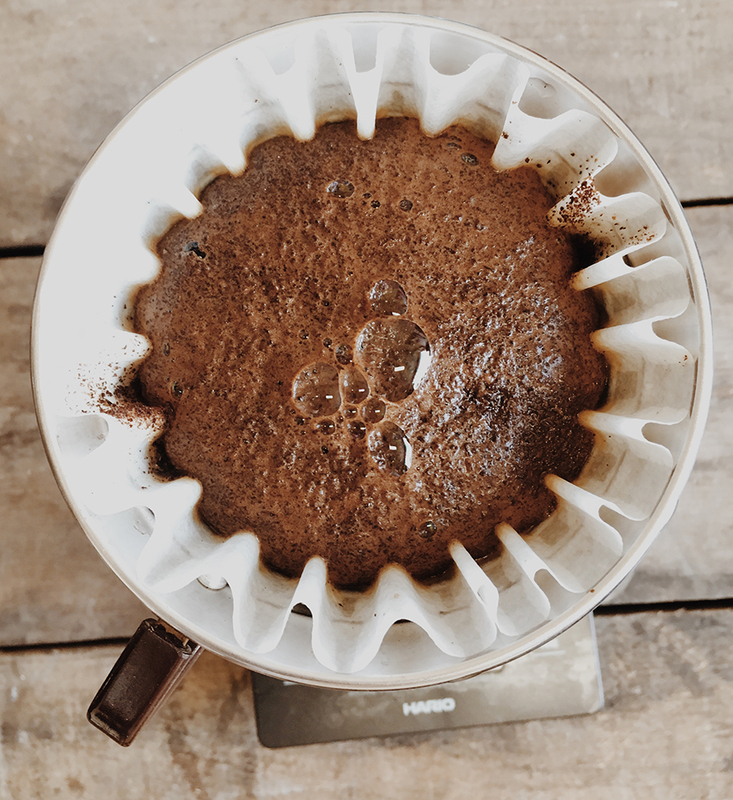 The flat bottom pour over provides a perfected coffee steep time which brews a consistently clean cup and truly brings out the distinctive flavors in each selection. 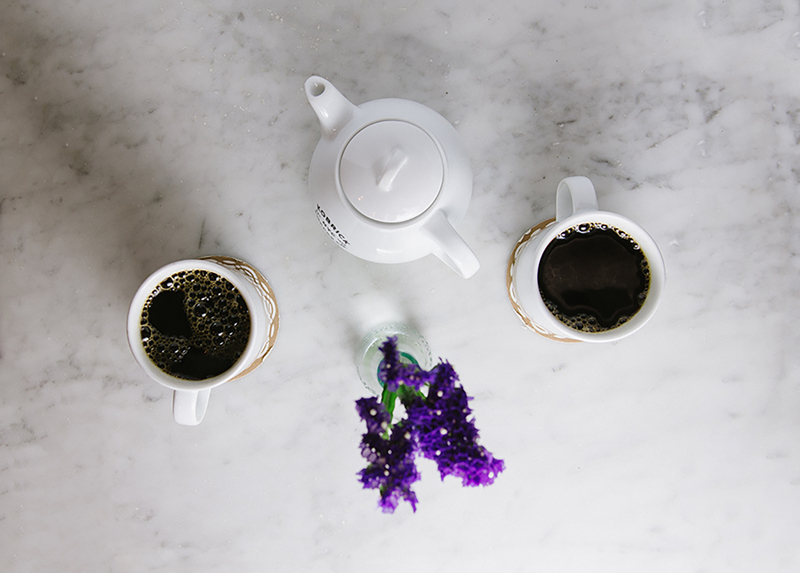 When we are having a family breakfast or are entertaining friends, we like brewing our blends in an 8 cup French Press. The French Press brews a full bodied cup of coffee that can create a heavier, bolder cup that stands out on its own. Also, we use the 8 cup French Press for cold brewing coffees overnight. We then pour the cold brew into a pitcher and store it in the refrigerator for a few days (if it lasts that long!). 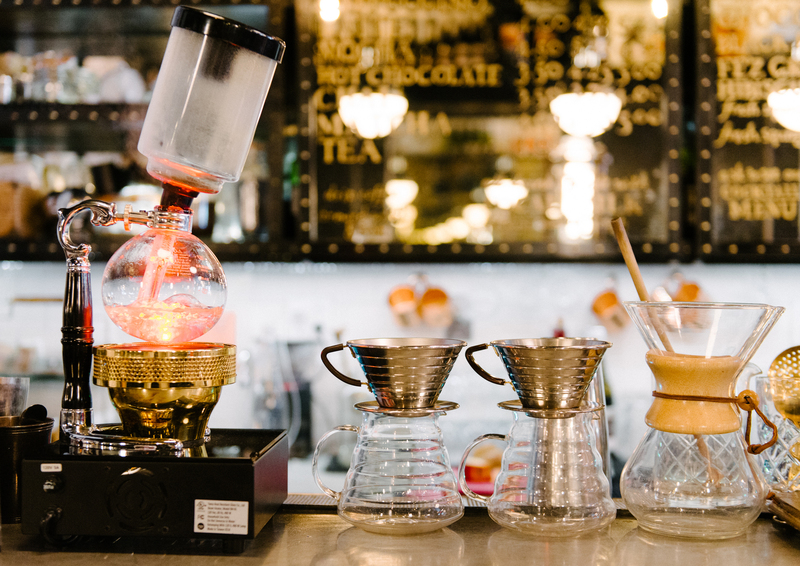 We recommend alternating with these brewing methods because the fun is in experimenting and experiencing the variety in flavor that each offers. We are celebrating National Coffee Day, September 29th, all week with free shipping online (for $30 or more) with coupon code COFFEEDAY17 through October 1, 2017. What are your top tips for learning what you like as far as single origins are concerned? Each origin offers a specific cup quality with many different flavors which is really special to drink by itself without having to blend with other coffees to balance it. It's nice to keep trying new origins and lots and stay open minded, because you never know when you'll come across your new personal favorite. 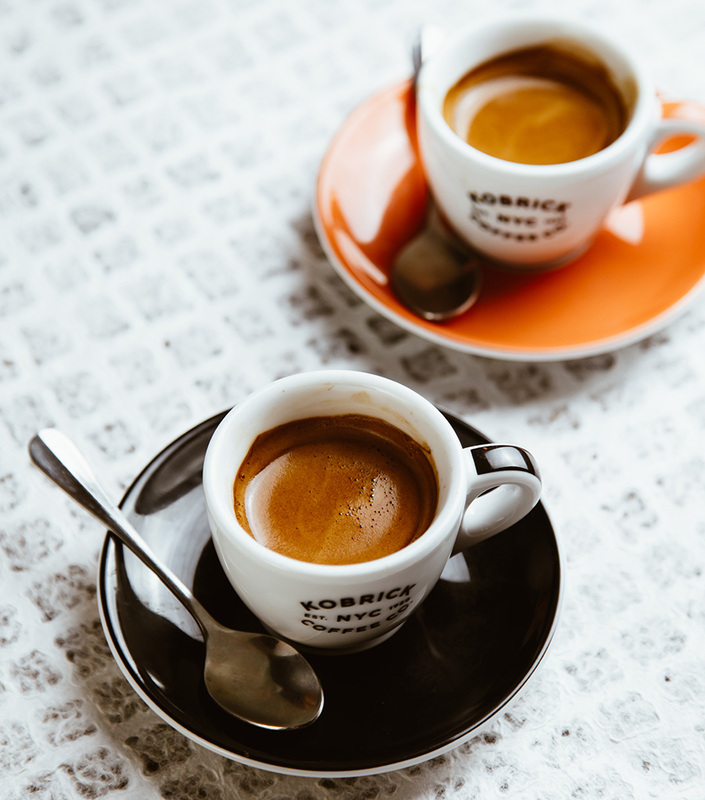 We offer an amazing variety of single origin coffees from around the globe that have been selected for their excellent flavor and body and will satisfy the most discerning palate. How long did it take to improve your palate to feel confident in your cupping skill required for purchasing coffee? I cupped and graded every type of coffee I could as many times as possible with traders, and roasters every work day before I was confident enough with my palate to take a job as a commodity buyer/manager. 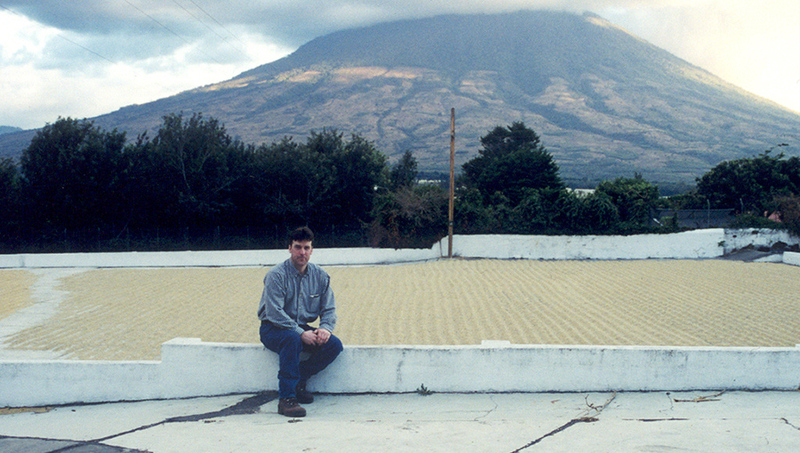 It was only after that four year time until 1992 in the coffee industry, that I felt I was good enough to take on that position and started working with the Kobrick family in 1993. Since then, I have cupped and tasted the best coffees in the world and have been offering them to our wholesale and retail customers. Direct from the Kirinyaga District of Kenya, from the Muchagara wet mill, we have this limited time offering. Kenya Muchagara is grown at 1700-1800 masl, in an area rich with volcanic soil - the coffee is washed and sun-dried on raised beds. Offering a combination of smooth body and dynamic acidity in the cup, which are inherent qualities of coffee from this region, this coffee is perfect for the upcoming season, filled with notes of citrus, cranberry, maple and brown sugar. As recovery from Hurricane Harvey has begun, and Hurricane Irma crashes in, we are witnessing destruction, while coming together to help. Donations and sacrifices made to help each other in a time of need is inspirational and the hope we can cling to. As photos are posted showing devastating sadness, the comments to follow - "what can I do to help" brings out our instinct to continue to work together. 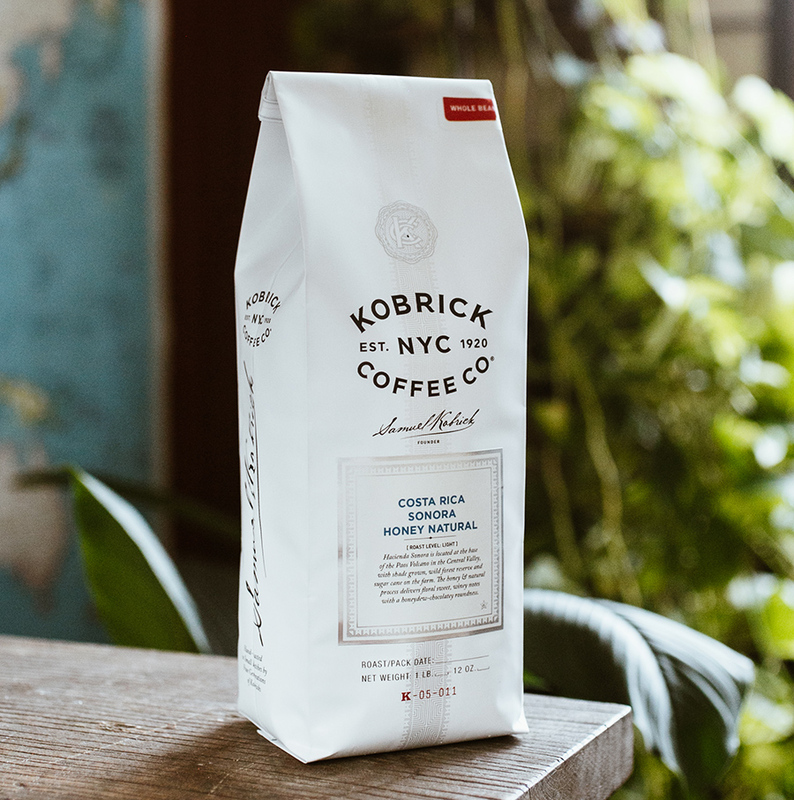 Through our Fair Trade Organic Brooklyn Blend we donate 15 cents per pound toward animal rescue group organizations in New York City. This month we will donate the funds to charities directly involved in hurricane relief. One example is the Houston SPCA, and as Florida organizations begin their work we will donate toward the needs there as well. During this time of great need, we can come together, maybe over a cup of coffee, to toast to unity. Click here to read more about our Charitable Partnerships and the story of FTO Brooklyn Blend. 10% off online with coupon code STEAM through September 7th. 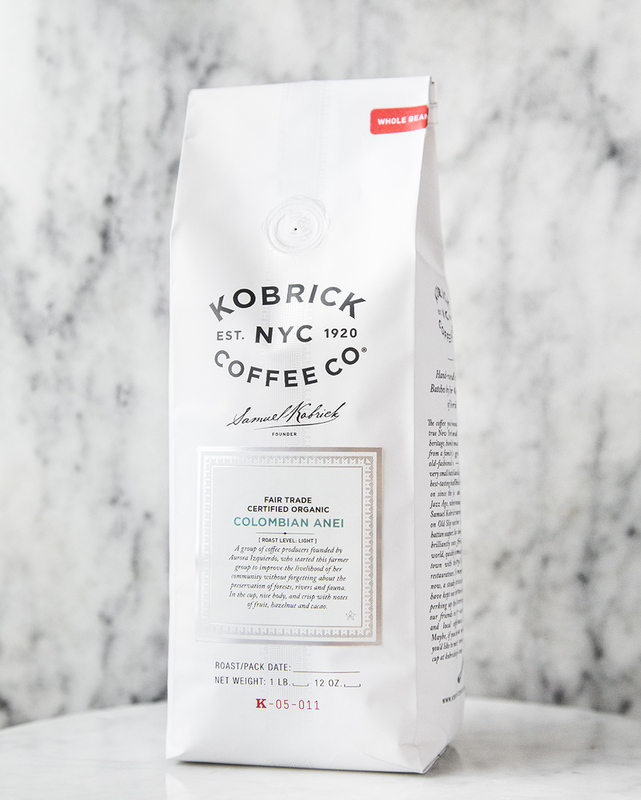 We are excited to introduce our new light roast blend, which we just launched this week. This coffee is blended after roasting and includes three stand out certified selections. Rainforest Alliance Certified STEAM Blend: Certified coffees including both Fair Trade Organic Ethiopian Yirgacheffe & FTO Sumatra, with Rainforest Alliance Certified Colombian. In the cup; smooth notes of dark chocolate covered cherries with a lemony-citrus twist. Our STEAM Label stands for (Sustainable Trade for the Environment Animals and Mankind). 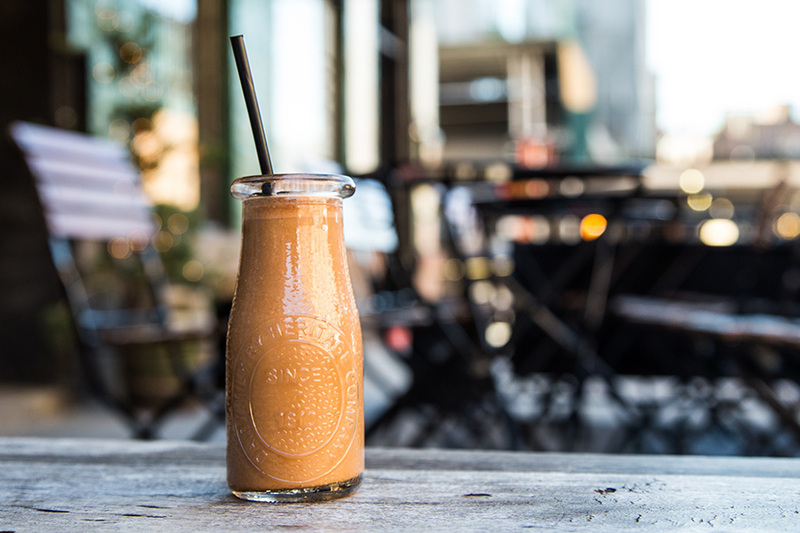 Make your own cold brew with our Broadway Lights which we blended for a smooth everyday cold brew coffee. 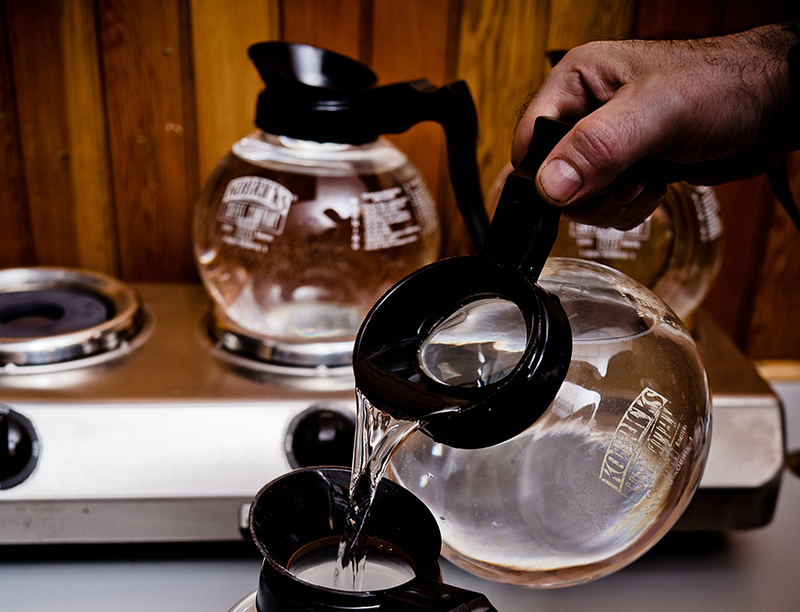 Brew a french press with cold filtered water (instead of hot) and let it steep overnight at room temperature. In the morning press the top to separate the grinds from the liquid. To make the Koco Freddo; use a cocktial shaker with 3.5 oz. of cold brew, .75 oz. of maple syrup, 1 egg white and one teaspoon of coconut oil. Shake rapidly, pour over ice and enjoy. 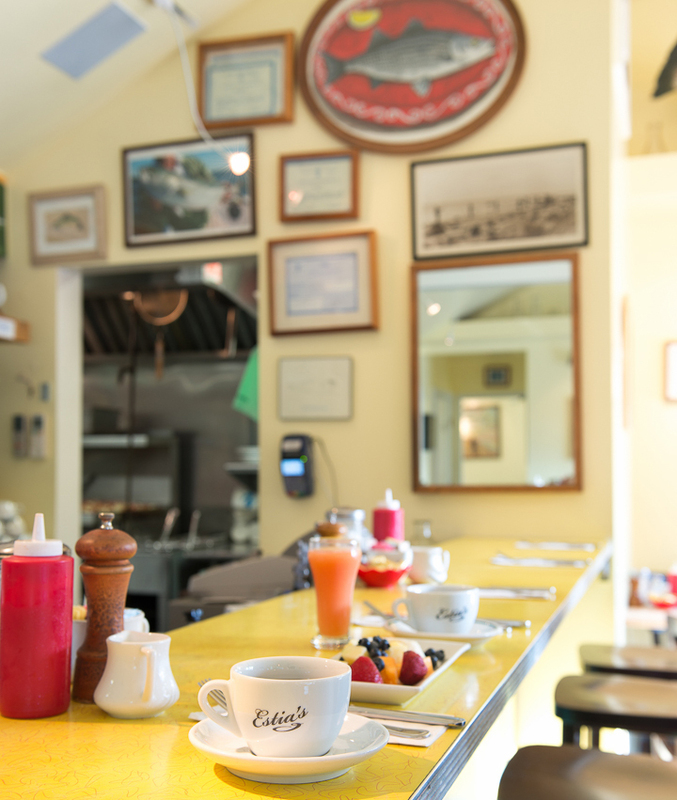 Estia's Little Kitchen (photo above by Jane Beiles) This Sag Harbor restaurant (plus new coffee cart) has been one of the most beloved destinations in the Hamptons for decades. Also a family business, by Chef/Restaurateur Colin Ambrose, they've been proudly serving our Cape Horn Blend since the 90's. Their gorgeous, large and bountiful garden on the property offers the full farm to table experience. 434 on Main (photo right) This family owned, dog friendly, beach house in Amagansett "Lodging by the Sea", offers cozy rooms and French Pressed Kiss of Africa with breakfast. Located minutes away from the beach and a short walk from NYC train and Jitney stops, it's a beautiful place to experience the relaxing lure of the Hamptons. City Vineyard at Pier 26: Hudson River Park, in Manhattan, has transformed the landscape along the waterfront into a place of nature and beauty and, along with sports, recreation, special events, restaurants and piers, it's an experience like no other. 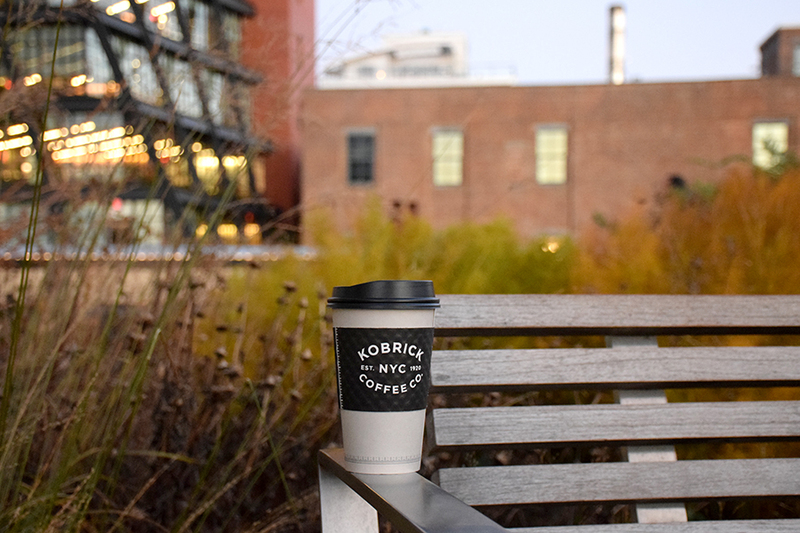 This new City Winery location in Hudson River Park, with a roof deck and beautiful outdoor patio, offers views of the Hudson, delicious food and wine, serves our Tiger Stripe Reserve Espresso and a custom City Winery Kobrick Coffee Blend. Between the city lights and the sailboats passing by, it's a very unique NYC experience. The mason jar; reminiscent of preserving summer crops, they're also the perfect vessel to enjoy cold drinks during these hot summer days - great for homemade soda pop, fresh squeezed juices, and cold brew! Ahhh... summertime! 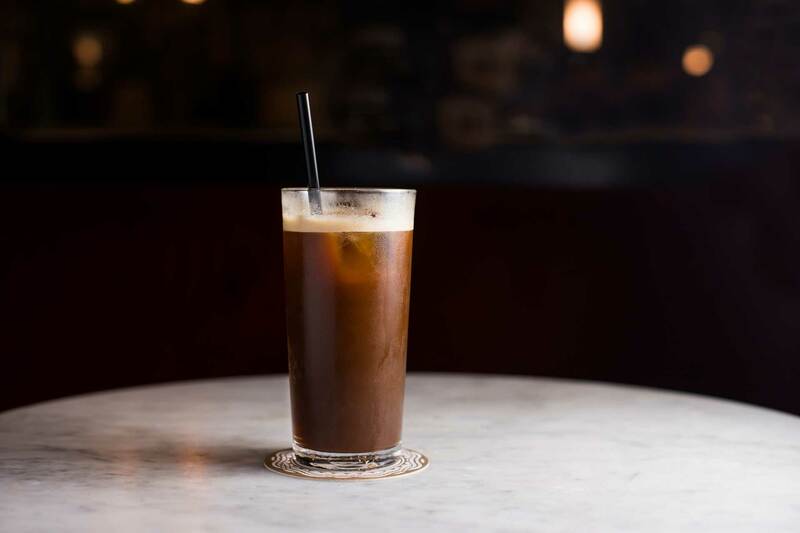 Make an Ethiopian Sidamo Guji or Broadway Lights - cold brew at home in a French Press and enjoy the enhanced flavor a favorite new glass can bring out. This week these featured accessories and cold brew offerings are 10% off. No coupon code needed. Broadway Lights - Buttery, smooth with rich, balanced flavor, replete with hints of mellow spice, citrus and chocolate. Vibrant, classic flavor. Ethiopian Sidamo Guji - An exceptional natural or dry processed coffee from the famous Sidamo region that is rich and complex, with vivid black and blueberry notes, medium acidity and full body. 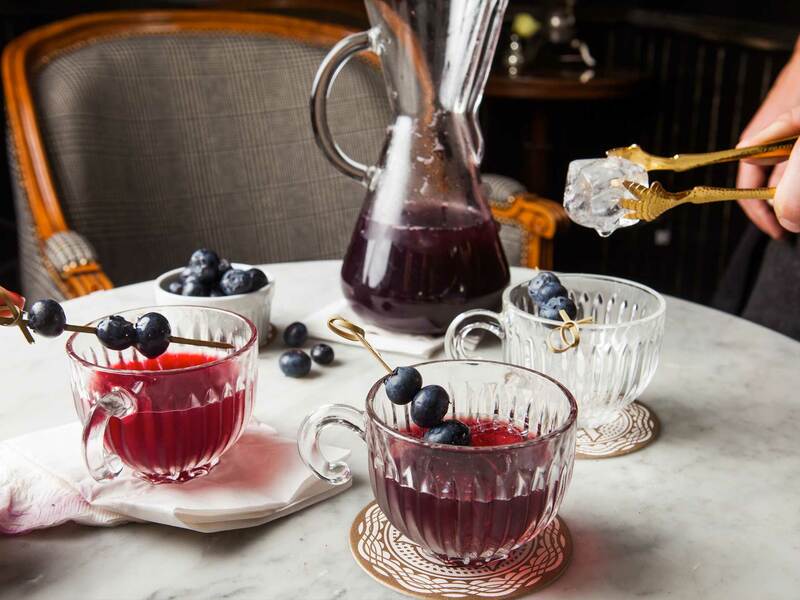 French Press - This classic Chambord French Press is a great way to brew coffee at home. 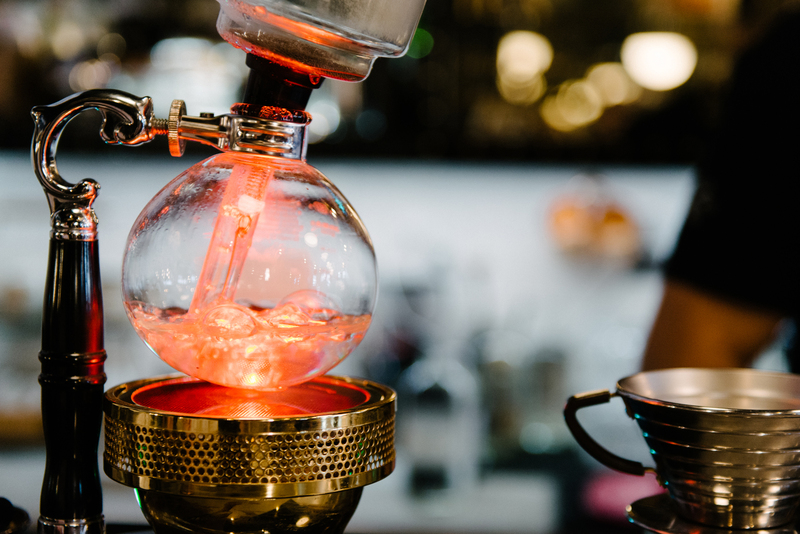 We like the glass beaker because it allows you to visualize the brewing process. Mason Jar - These 12 oz. Mason Jars are perfect for cold beverages or cold brew storage. They can be washed and reused as a glass, or storage container. Starting this week there will be a new label on all of our certified and single origin coffees. We have been rising toward a more sustainable future. A focus on recycling, composting, going green alongside products that do good for the world have grown within our regular business practices. 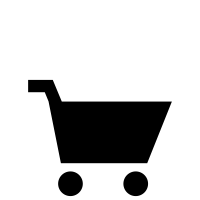 This STEAM label is our new stamp to encompass this movement. 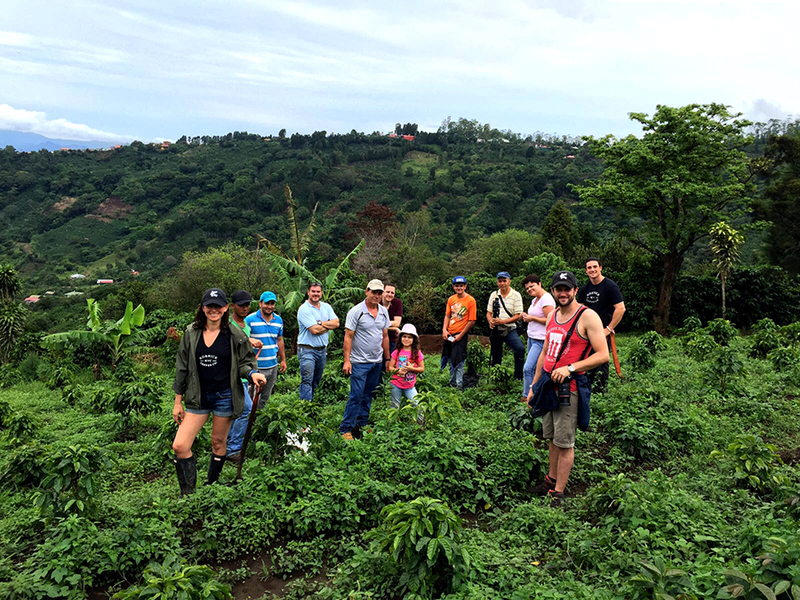 Not only do the coffees give back to various organizations and conservation projects, but the concept is to help spread the importance and awareness around coffee as a product which has the ability to do good and give back to the earth, naturally. 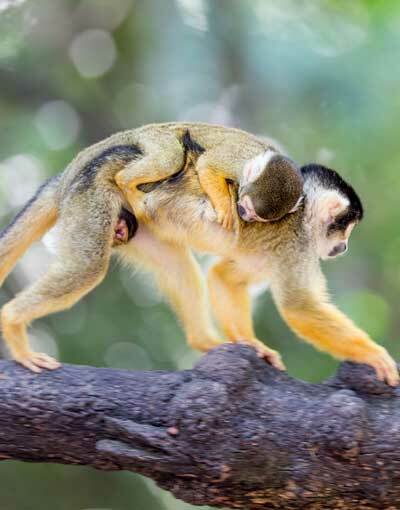 All around the world, including coffee growing regions, our earth has seen rapid deforestation and pollution. Our business actually has the ability to help combat this and turn it around...if we put our heads and hearts together we can help! STEAM... rising up with each cup! 10% off online with coupon code GARDENSTATE through August 17, 2017. Square 1 (photo above) is perched on a charming corner in an up and coming area of Jersey City. The cafe is an icon of gentrification in the neighborhood, while artists move into the warehouse & loft spaces down the block, you can just turn a corner toward warehouses converted to galleries. 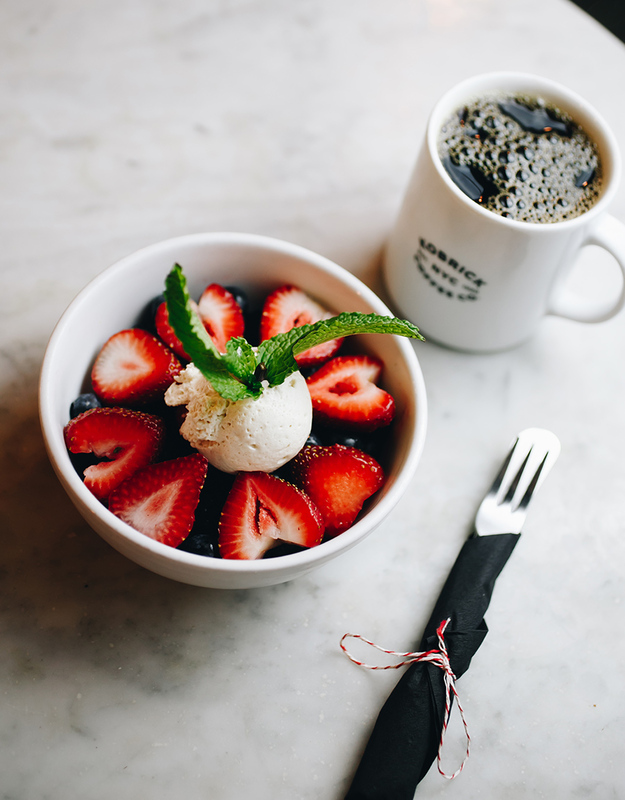 The beautiful menu for breakfast and lunch focuses on nourishment and includes fresh baked and locally farmed ingredients with our Kiss of Africa Coffee and Tiger Stripe Espresso. 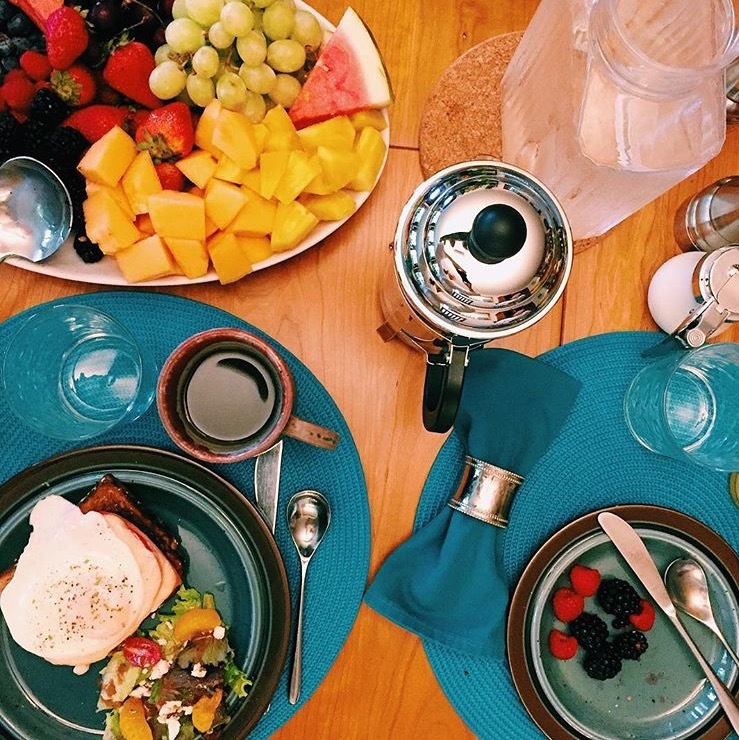 The Farmhouse Cafe - With two locations in Westwood and Cresskill, the country style menu includes breakfast offerings such as avocado toasts, pancakes, omelettes and brioche french toast. Lunch and dinner offerings include amazing salads, entrees, adult mac & cheese, plus delicious hand cut and sweet potato fries. Here they offer our coffee by the pound and by the cup, as well as a full cafe menu with iced coffees and lattes too! Glaze Donuts - For all natural, just made donuts, try Glaze. With three locations and two more on the way, Glaze makes delicious, daily batched donuts, crafted with passion and creativity. Photo above shows their strawberry-Nutella donut. 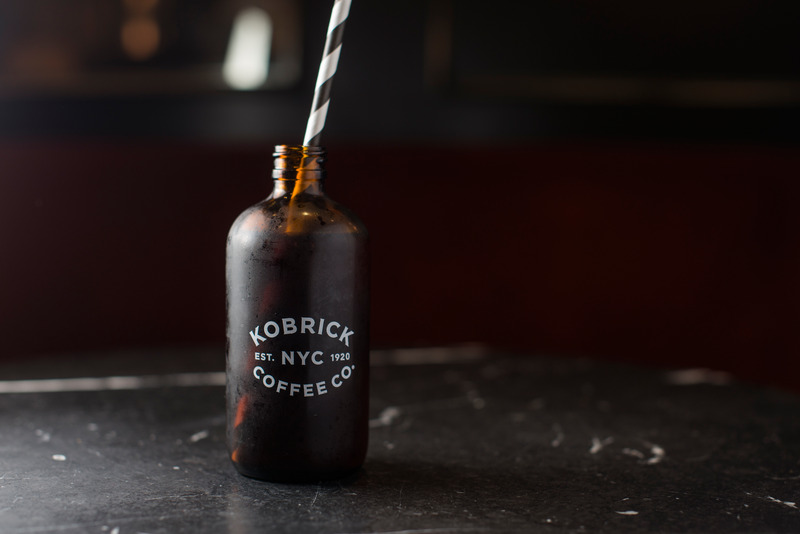 Also, with a variety of Kobrick Coffee including by the pound to take home, and in-house-batched cold brew, this sweet stop is a real treat. Glaze is also a great place to pick up desert for a party or housewarming gift of donuts & coffee! 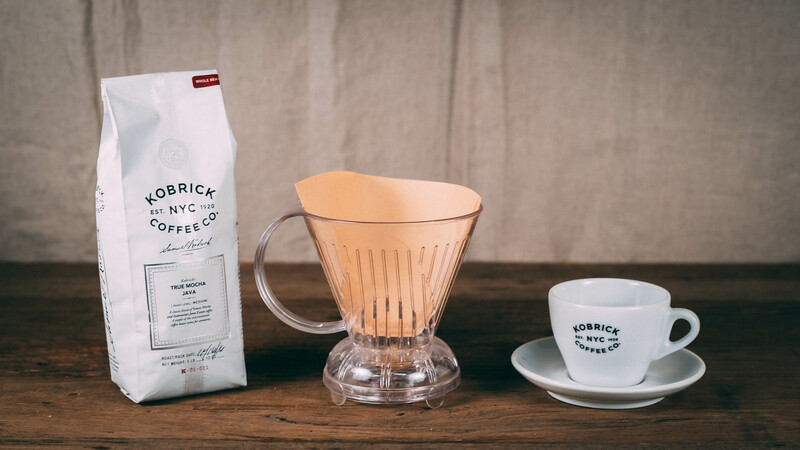 Coupon code NYCCOFFEE (Free Shipping for $30 or more, until August 10, 2017). 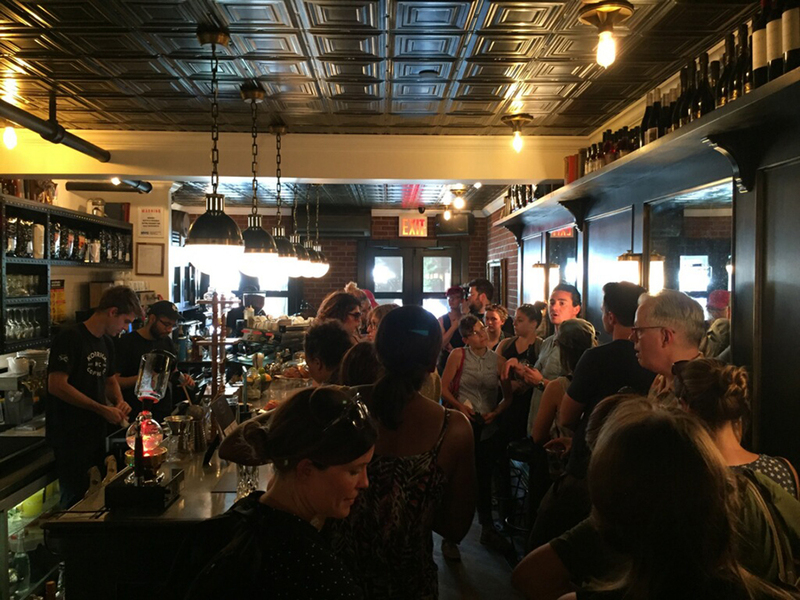 Photo above from The New York City Coffee Book Launch Walking Tour on Monday. Now available on Amazon - New York City Coffee by Erin Meister. 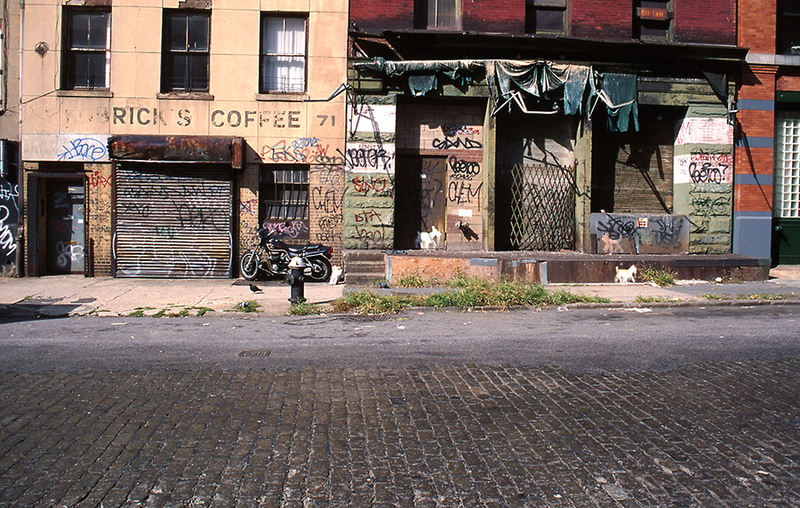 New York City Coffee pulls together the story which, with the colorful characters, roasters, writers, and classic NYC places, is such an enjoyable read. This fascinating timeline explores the earliest days all the way through to today, with a passion for coffee, New York City and our unique & dynamic business. We are thrilled every day to be a part of it, and thankful to be a part of this "Caffeinated History" book. To celebrate, we have free shipping online this week! We are celebrating with 10% off online, no coupon code needed. Finca Mirador in Costa Rica is a special place. This beautiful farm, high in the mountains, had been offering their coffees to the market mixed with other local beans. After tasting their coffee and meeting the family we knew this cup would stand out as an exceptional micro lot selection. Our fresh bags of Direct Trade Micro Lot Costa Rica Mirador Honey Process arrive today and will be ready to ship tomorrow. We are celebrating with 10% off online, no coupon code needed. Photos from last year, while planting trees for our Kobrick Coffee Canopy Tree Project. 15% off Ethiopian Sidamo Guji this week. No coupon code needed. Cold Brew is such a fantastic way to enjoy coffee, especially during summer! It's also so easy to prepare at home. Using these brew instructions you can cold brew at home with a french press for smooth sipping all summer long. One coffee that stands out through the cold brew method is Ethiopian Sidamo Guji. An exceptional natural or dry processed coffee from the famous Sidamo region that is rich and complex, with vivid black and blueberry notes, medium acidity and full body. 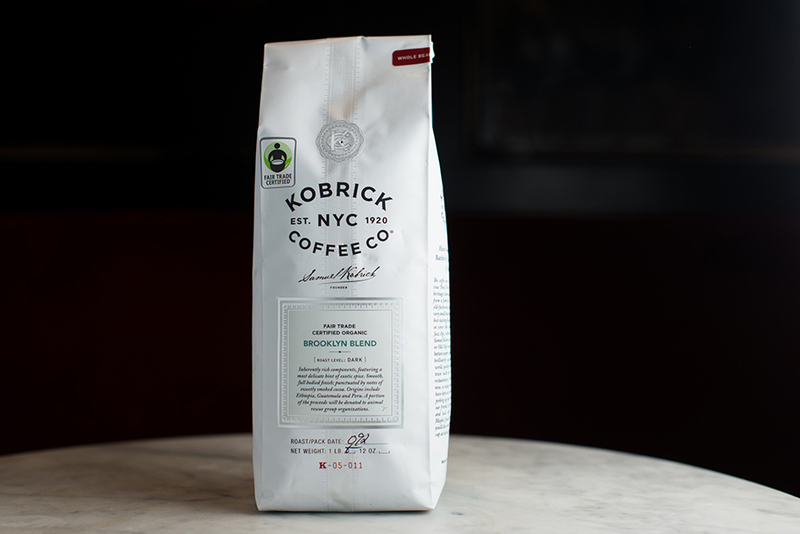 15% off FTO Brooklyn Blend this week. No coupon code needed. Fair Trade Certified Organic Brooklyn Blend is a Dark Roast; Inherently rich components, featuring a most delicate hint of exotic spice. Smooth, full bodied finish; punctuated by notes of sweetly smoked cocoa. Origins include Ethiopia, Guatemala and Peru. A portion of the proceeds will be donated to animal rescue group organizations. Here's The Story: On a snowy night in Brooklyn, a pregnant cat was found – scared and shivering – and brought to a local shelter. Within 24 hours, “Brooklyn” was adopted by the Kobricks. Five bundles of joy were soon born, and in time, each was placed in a loving forever home. Wishing that all the sad “tails” of homeless dogs and cats could have the same happily ever after as Brooklyn and her kittens, we have created Brooklyn Blend. A portion of the proceeds will be donated to shelters and rescue groups who feed, care for and find families excited to open their hearts to a furry friend awaiting that joyful day when they go home. Add some change to the kitty. Fetch a cup to help a pup. Purrs, woofs and gratitude for your help, and please spay it forward! Tanzanian Peaberry - 15% off this week, no coupon code needed. Tanzanian Peaberry... yes it's fun to say, but it's not just a cute trip off the tongue, it's also a cute looking bean! 15% off this week, no coupon code needed. A Peaberry (photo above) is when a single compact round bean develops, rather than the normal two flat sided beans in one cherry. In Spanish they are known as caracol or caracolillo "little snail". 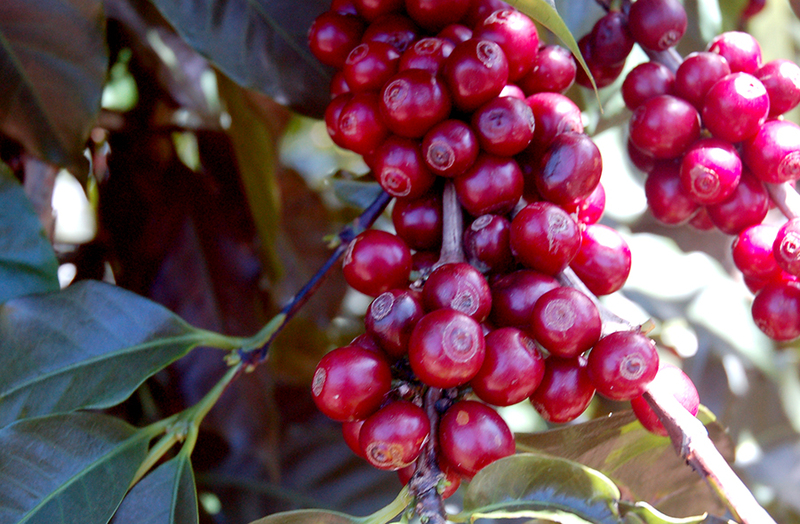 There are peaberries developed in coffee cherries (photo below) on farms all over the world, and many times they get mixed in with the regular beans, and go unnoticed. Sometimes they are sorted out and sold separately, as they are with our Tanzanian Peaberry; Intense, full flavor and body. Beautifully aromatic and winey, snappy and vibrant. 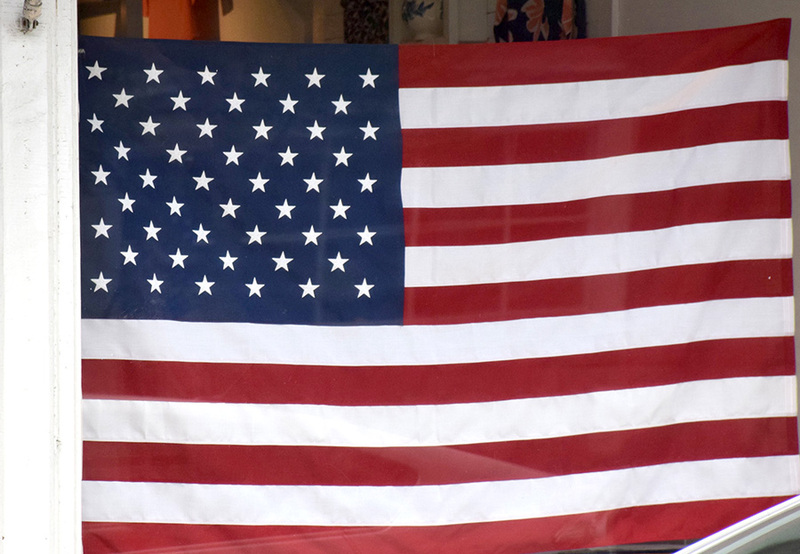 The Fourth of July is one of our favorite holidays, a hallmark of the beginning of summer. While the scent of fresh cut grass, the sound of birds singing, poolside parties, and spectacular fireworks burst in the air; we are celebrating with free shipping online with coupon code FOURTH (for $30 or more, through July 5th). 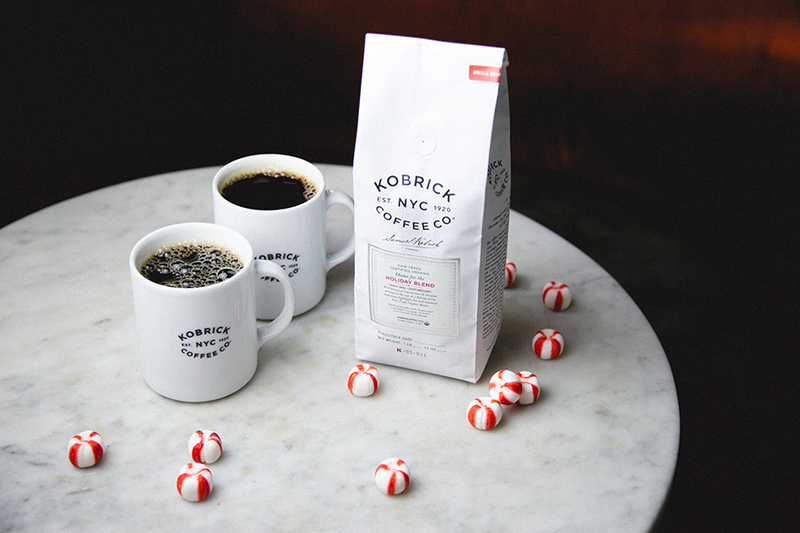 At Kobrick Coffee in NYC, you can join us for red white and blue offerings like a Negroni, Bubbly, or a coffee cocktail pitcher of Black and Blue Punch. 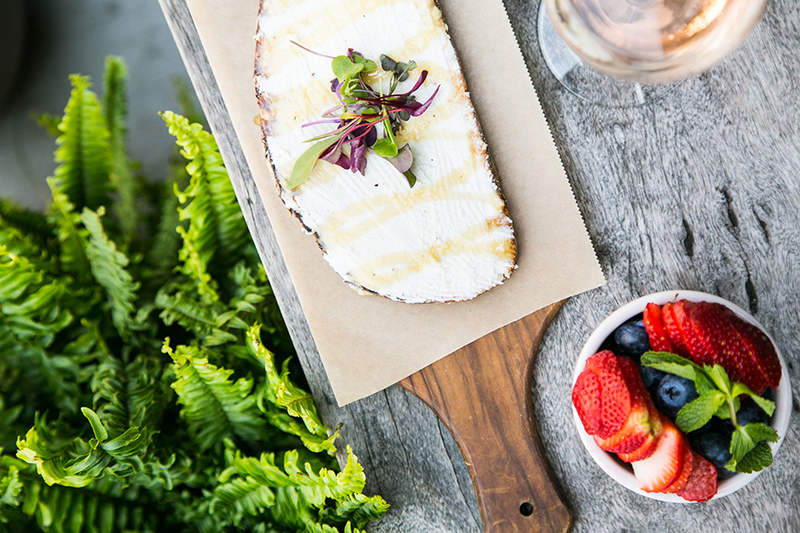 Celebrate sweet summertime, with a Vanilla Bean Cheesecake or Strawberry Jam Toast. Have a wonderful long weekend and a blast this Fourth of July! The first day of summer is here! We are celebrating with 10% off online with coupon code GRANITA (through June 28th) . On hot summer days at the roasting plant we make Coffee Granita for everyone to share. Its so easy to make and a sweet summertime treat. Ingredients: 2 cups of cold brew coffee (click here for brew instructions) or double strength coffee, 1 cup sugar, 2 teaspoons vanilla extract Preparation: Stir together coffee, sugar and vanilla extract and pour into a a baking pan. Place in freezer and stir every 30 minutes - about 2 hours or until slushy. Scoop into serving cups and enjoy! (use same day for the best consistency) Also our 16 oz. 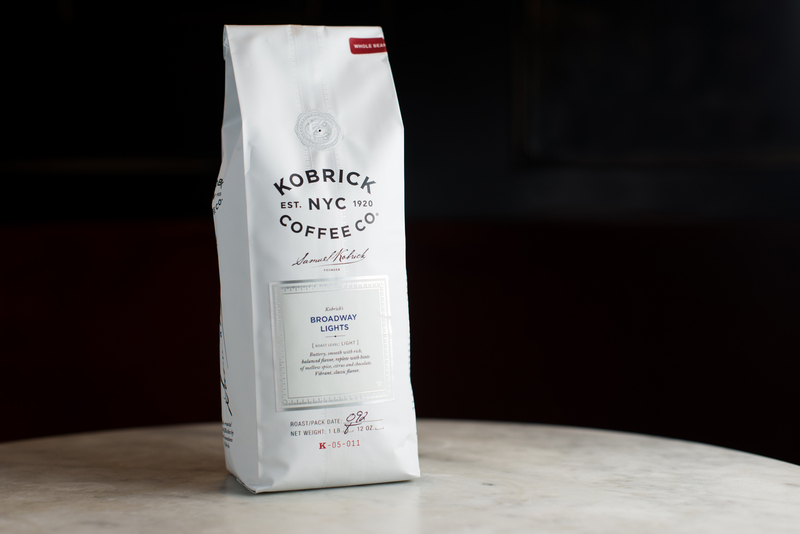 Kobrick Coffee Boston Rounds are now available. Happy Summer! 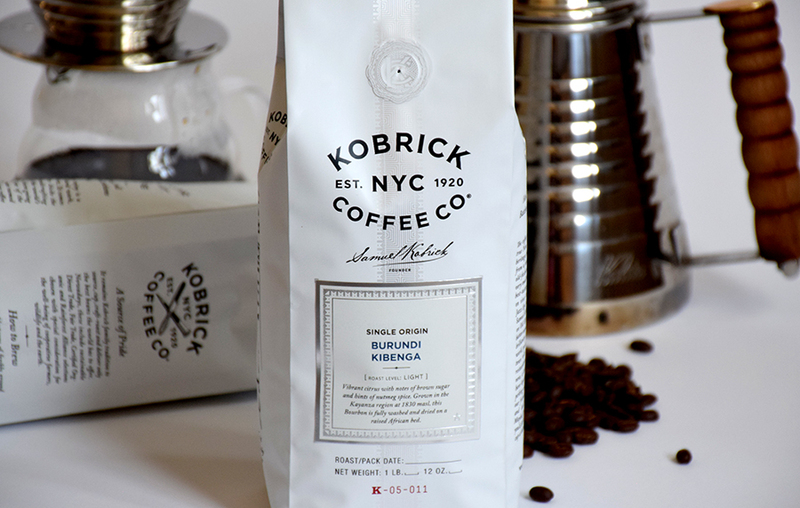 Burundi Kibenga; Vibrant citrus with notes of brown sugar and hints of nutmeg spice. Grown in the Kayanza region at 1830 masl, this Bourbon is fully washed and dried on a raised African bed. 15% off this week (no coupon code needed). Kibenga farms are part of the natural reserve forest with high mountains in Burundi, Africa, filled with young coffee plantations. The coffee is washed at the Mpanga washing station. Importer Notes - "Located in the Kayanza region, Mpanga washing station processes coffees from 3,400 farmers which are then separated into lots named after the surrounding hills of which they are grown. These surrounding hills are located between 1,750-1,950masl: Karurusi, Maruri, Nyangwe, Ntarambo, Nyabikaranga, Kibenga and Kinyamukizi. 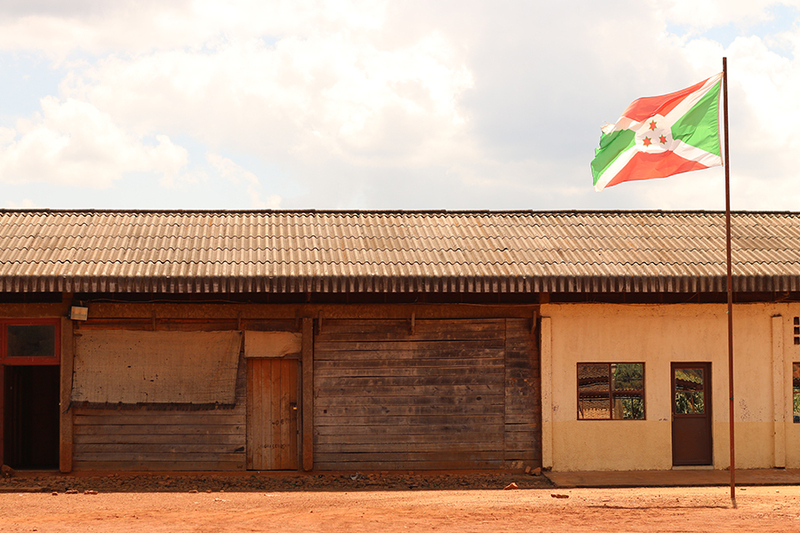 Mpanga Washing Station is well recognized for the complex, clean specialty coffee that come from Burundi. Mpanga is equipped with 450 drying beds and a six disc McKinnon pulping machines. Total production is about 1,500 tons of cherry per year. Mpanga has garnered high scores in the Burundi Cup of Excellence, including 1st and 3rd place in the 2014 COE. The washing station was built in 2008 under the initiative of Jean-Clement Birabereye, who manages the milland represents the farmers through the trading company SEGEC (Societe General d'exploitation et d'exportation du Cafe). Jean-Clement boasts an incredible resume, with more than 15 years of experience in milling. Through SEGEC, Jean-Clement offers a premium to producers whose coffees place in competition, motivating farmers to meticulous harvesting and agricultural practices. The station prides itself on paying above market price for cherries to encourage high quality production at each harvest." 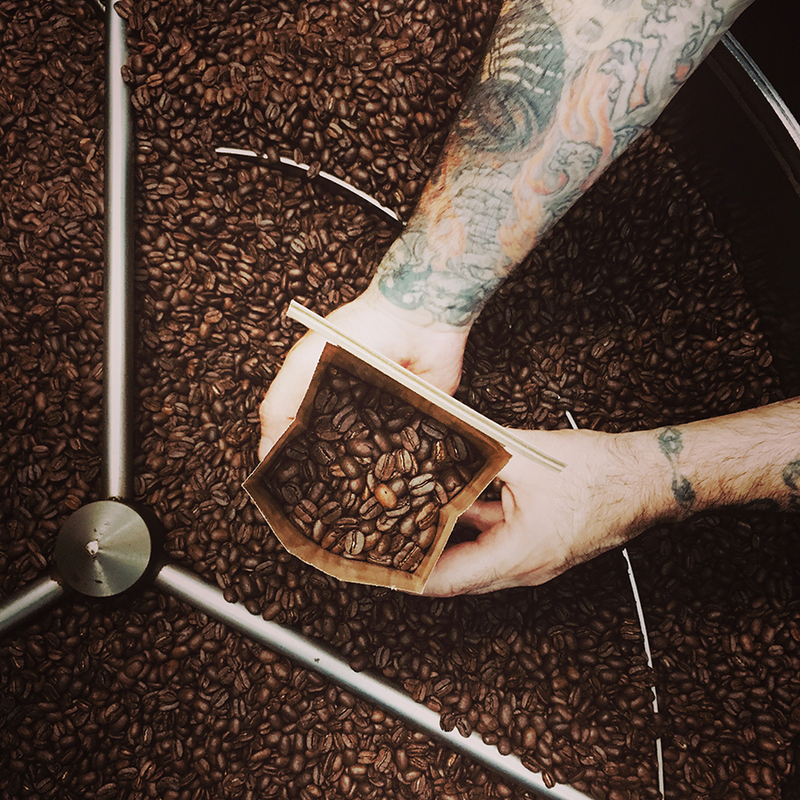 Long in the works, and finally worthy, our 100% Certified Organic Espresso will rock your palate. Deeply complex and soft. Rich notes of chocolate and spice. 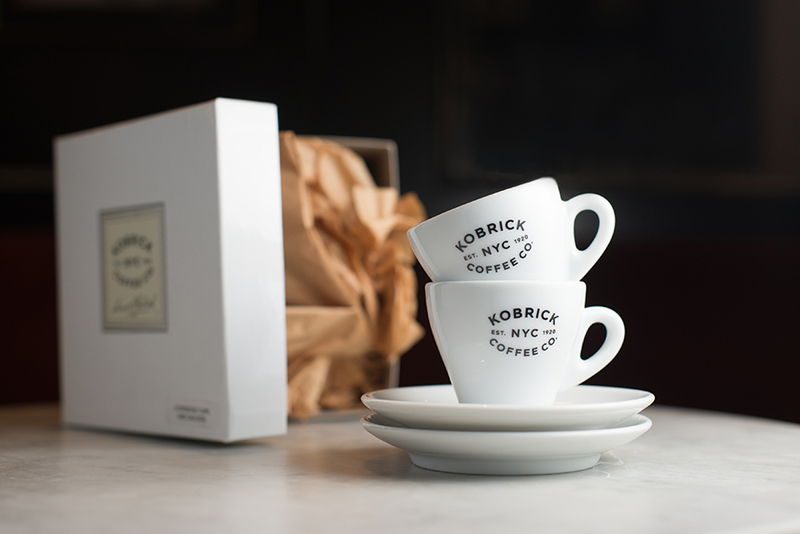 This espresso is named after our own coffee industry hero 3rd generation Kobrick Coffee Lee Marc Kobrick. His dedication, passion and refined palate, as well as a support of the organic and sustainable movement, inspires us everyday. This coffee gives back 15 cents per pound to our Canopy Tree Project. Growing coffee organically is much easier under a natural canopy. With our Canopy Tree Project we are converting full sun coffee farms to shade grown, to assist farmers to move one step closer to farm coffee in a sustainable organic way. We hope one day organic coffees are the norm, but in the meantime, you can try this amazing organic espresso which will "rock your palate". Available at 24 Ninth Ave. This Espresso is our top selling blend. 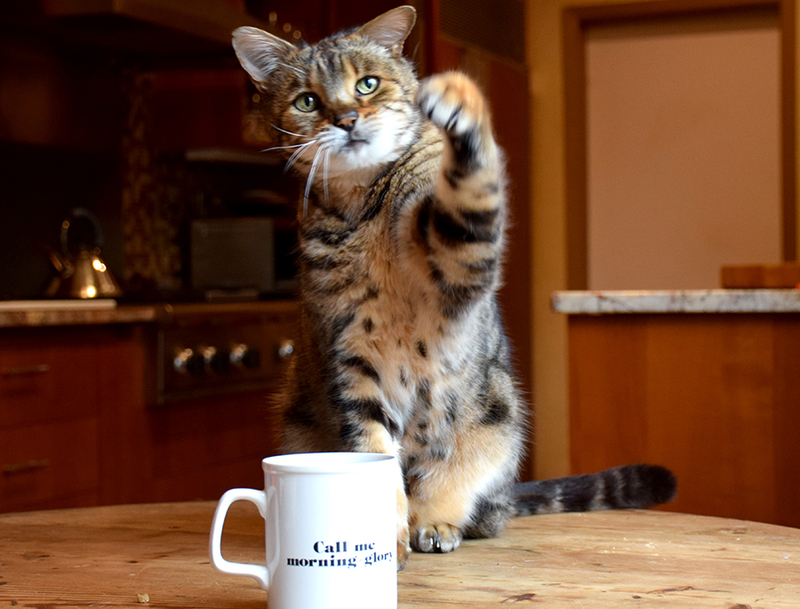 It is a STEAM Label coffee, with its Rainforest Alliance Certification as well as a donation of 15 cents per pound sold is donated to the International Fund for Animal Welfare to help save wild tigers from extinction. The blends name originated through tiger striping, which is the leading visual indicator of a good espresso extraction. Tiger Striping is formed by the contrast of darker and lighter crema in the espesso stream, as you can see in the photo above. At 24 Ninth Ave. an awesome cold option is the Tiger Stripe and Tonic. Outstandingly refreshing classic so easy to make at home. Using a cocktail shaker, pour your espresso over ice and shake. Pour over ice in separate glass and top it off with your favorite tonic water. 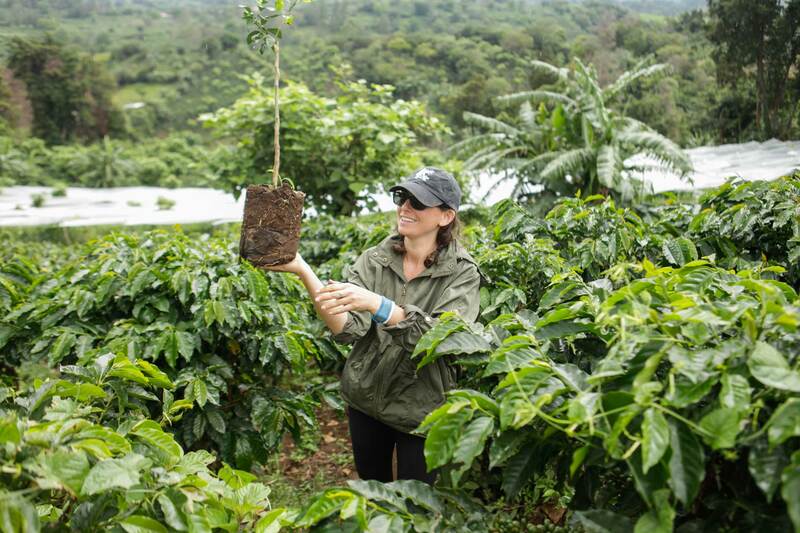 We just returned from a trip to Costa Rica to plant fruit trees on coffee farms for our Canopy Tree Project. While on the ground we planted 150 citrus trees on 4 farms. 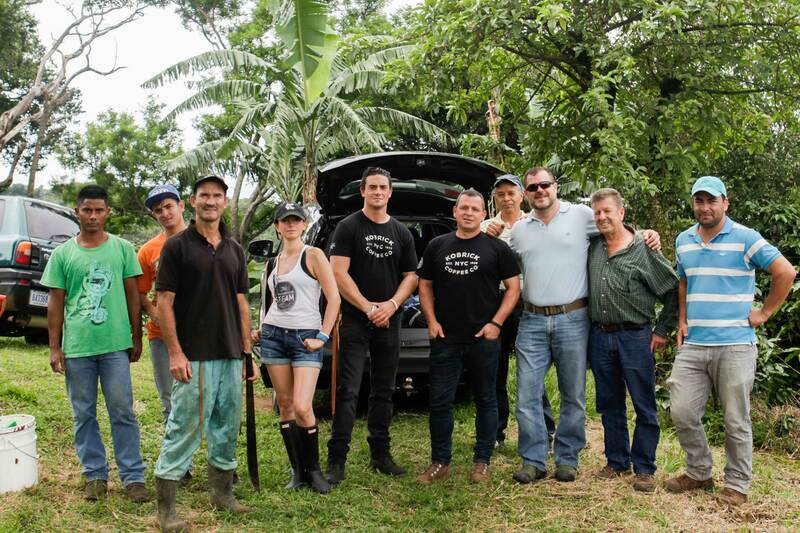 These trees will provide a number of benefits, as well as begin a revolution which needs to progress within the coffee industry for a more sustainable future. 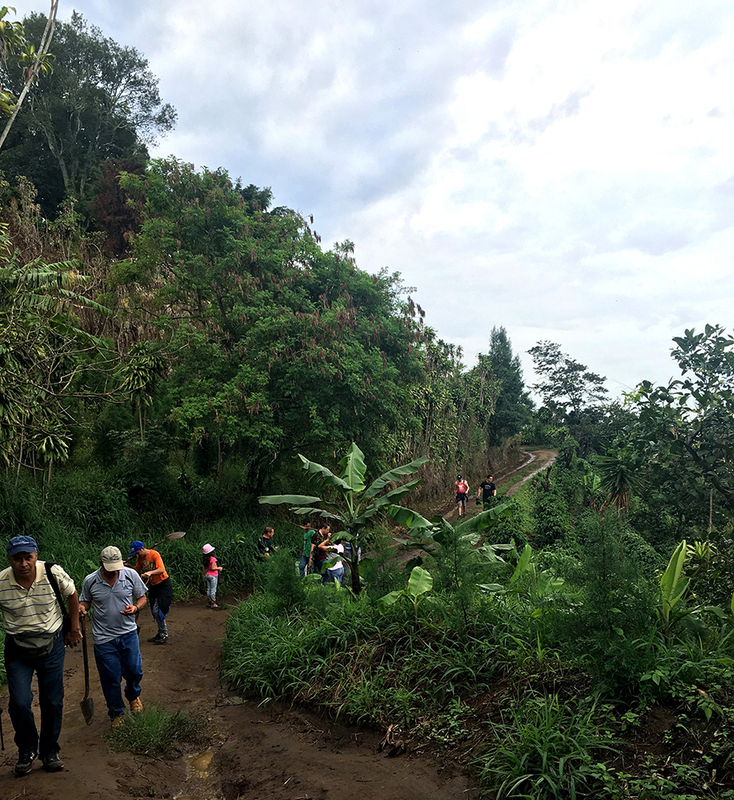 During our trip an important discussion was in course around developing economically feasible environmental practices on coffee farms, taking a graceful turn toward holistic sustainability. In addition to the big picture the little pieces all mean so much. Lets take one of the four farms to consider: Finca El Mirador is run by the Aguilar family. The family farm is run by a couple so passionate about their product. They understand the importance of shade and fruit trees within their plantation and had begun the process of implementing shade grown on their own. Their awareness of processing methods and quality as well as environmental impact are strong. As Cassandra (4th Generation) plucked a branch from a mature fruit tree and passed around the little black berries to each of us for a taste, we knew that in addition to the many earth friendly reasons we began this project, one simple one was shining through, sharing smiles, laughter and amazing moments which transcend borders! 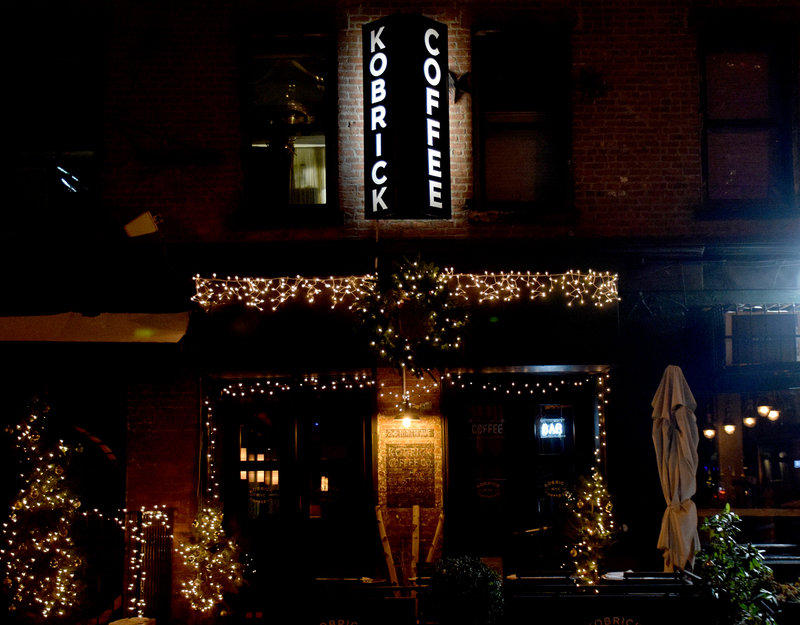 At the Kobrick Coffee Co. Cafe on 24 Ninth Ave. we innovate with coffee cocktails. A favorite from our summer menu is the Black & Blue Punch. 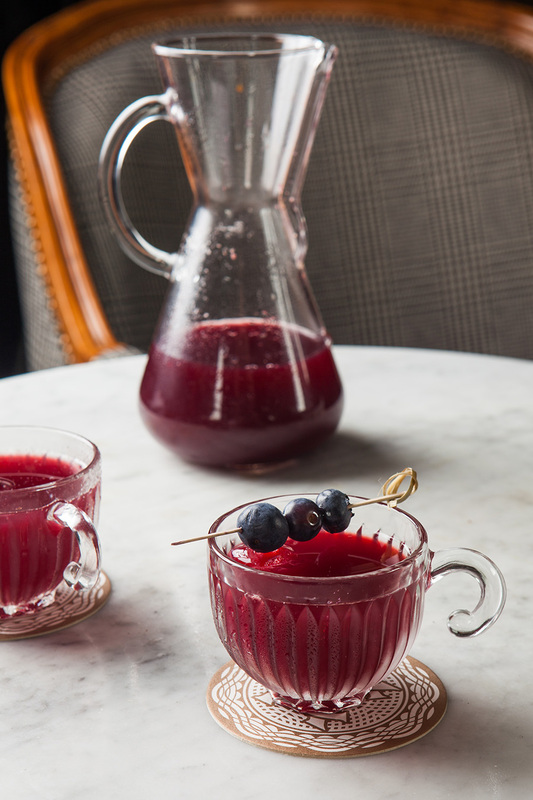 Celebrate Dad with this stand out refreshing punch recipe. Black & Blue Punch – .75 oz. Smith & Cross Jamaican Rum, .75 oz. Goslings Rum,. 1 oz. fresh lime juice, 1.5 oz. blueberry syrup (you can make at home heating blueberries, sugar and water simmered on a stovetop), 1.5oz Ethiopian Sidamo Guji Cold Brew (make it in a french press), 1 dash angostura bitters. 15% off our Ethiopian Sidamo Guji [ An exceptional natural or dry processed coffee from the famous Sidamo region that is rich and complex, with vivid black and blueberry notes, medium acidity and full body. ] through Fathers Day 2016 - no coupon code necessary. 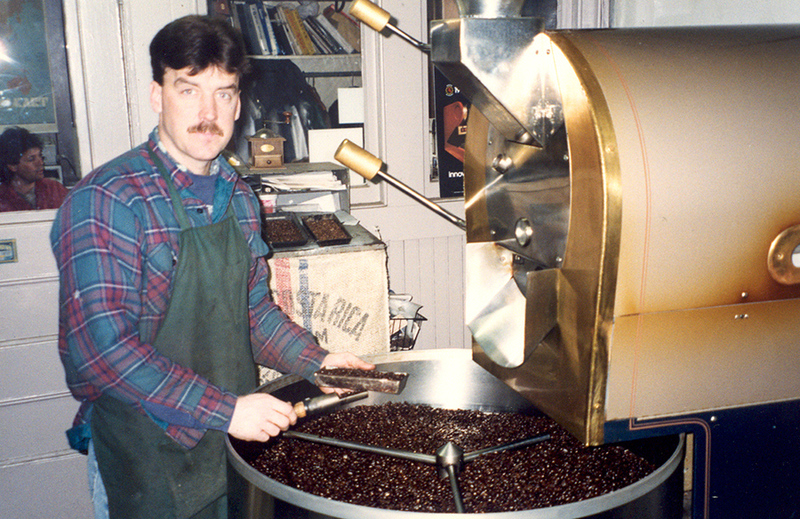 During our colorful history as coffee roasters, in the 1940's, we had offices at 414 Broadway in NYC. We named a few offerings with a reference back to that time while Great Grandpa Sam was running the business. We have named a few offerings after this time in history. Our Broadway Blend, remains one of our most popular house blends, our Broadway Lights, offers a lighter version of this blend, perfect for cold brew. 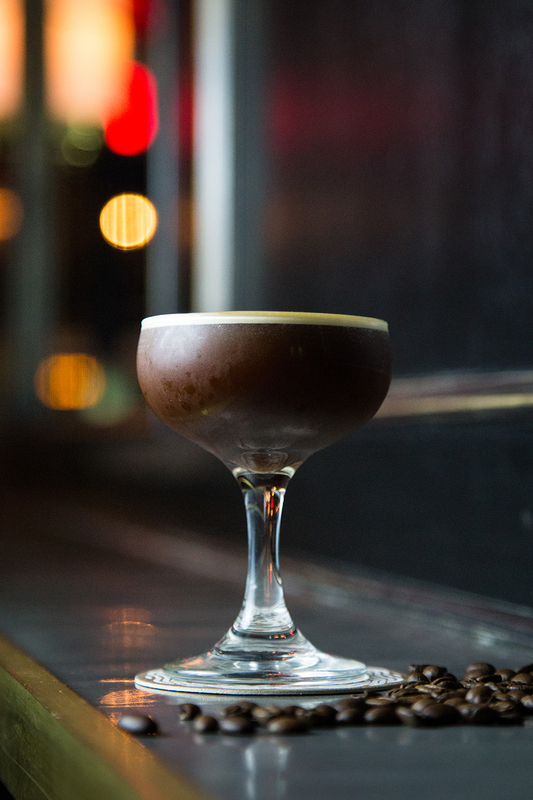 Shown here is our Bottled on Broadway coffee cocktail from 24 Ninth Ave. 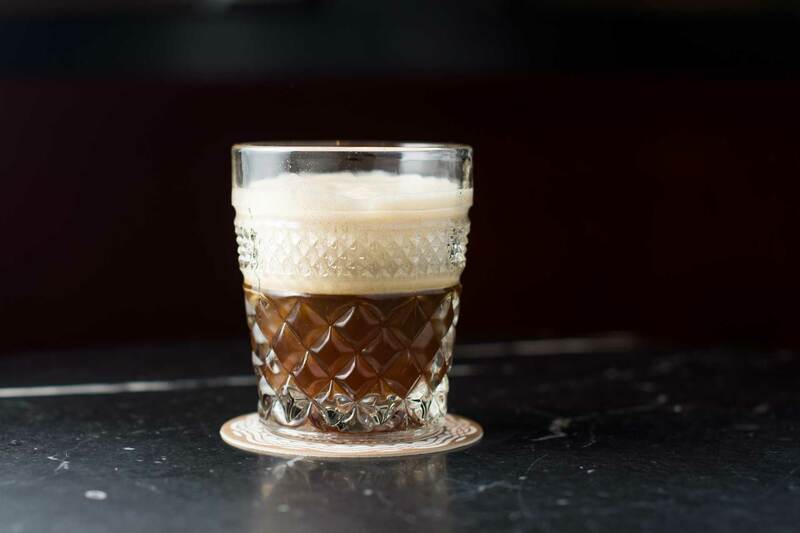 Served in our custom Boston round bottle the Bottled on Broadway Coffee Cocktail combines our in house Kobrick Coffee Liquor, with our Nitro cold brew, and Hella Aromatic Bitters.